improving reading achievement for diverse students. Proven to work, READ 180 has been the subject of continuous research and validation efforts for over 15 years. It is the most thoroughly researched and documented reading intervention program, improving reading achievement for diverse students. The percentage of READ 180 middle school students achieving proficiency on the TAKS more than quadrupled. Located outside of Houston, the Cypress-Fairbanks Independent School District (CFISD) enrolls more than 104,000 students in 50 elementary schools, 16 middle schools, 11 high schools, and four special program facilities. At the time of the study, the district’s student population was largely Hispanic (43%) and Caucasian (29%), followed by African American (16%), Asian American (8%), Native American (less than 1%), and Pacific Islander (less than 1%) students. Just under half (42%) of all students received free and reduced-price lunch through the National School Lunch Program; 16% of all students were English language learners (ELL). Growing interest in research-based education inspired district leaders to pilot READ 180 as a reading intervention program with a cohort of fifth graders in spring 2007. Due to the pilot’s success, the district expanded READ 180 to 31 elementary schools, 16 middle schools, and 11 high schools. 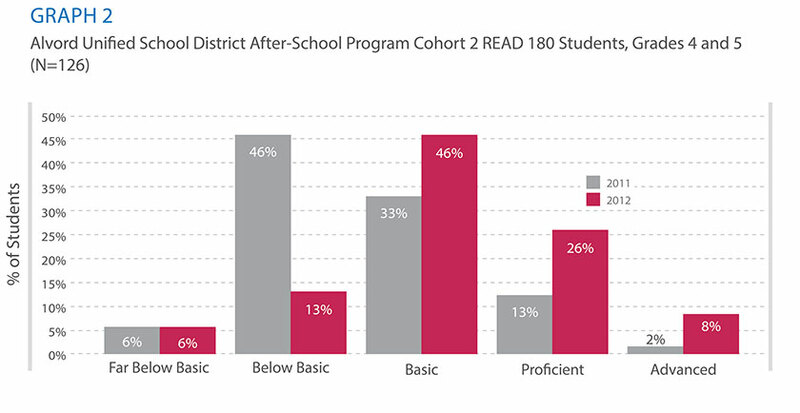 READ 180 was used as an intervention program for fourth- through twelfth-grade students who were reading below proficiency. Texas Assessment of Knowledge and Skills (TAKS) Reading and SRI data, along with teacher recommendations and grades, were used to identify and place students in the program. TAKS Reading and SRI data were collected and analyzed for students who used the program during the 2008–2009 school year. TAKS Reading data was obtained from a total of 2,249 students in Grades 4, 5, 7, 8, and 9 with valid pretest and posttest data. READ 180 students in Grades 4–5 and 7–12 were included in the SRI analysis, comprising a total sample of 2,799 students with valid pretest and posttest SRI data. 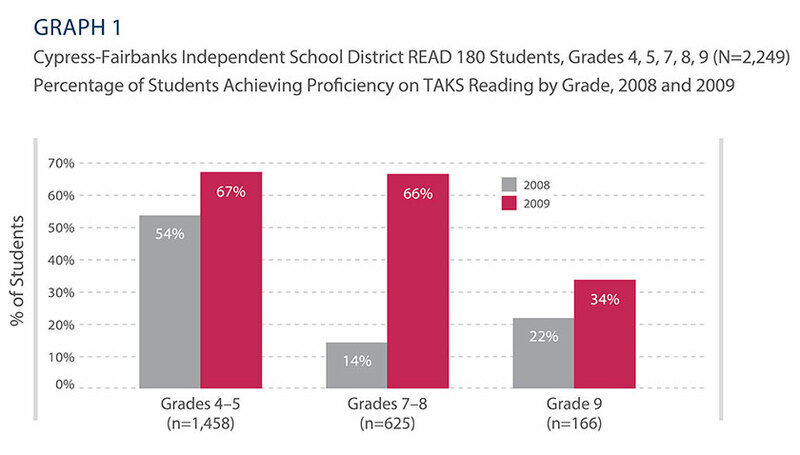 Across all grades in this analysis, the percentage of READ 180 students achieving Proficiency on TAKS Reading increased from 2008–2009 (Graph 1). Results were particularly impressive for middle school students who demonstrated more than a fourfold increase in proficiency rates on the TAKS. When results were disaggregated by education classification, upper elementary and middle school students with disabilities also exhibited gains. The percentage of upper elementary and middle school students with disabilities achieving Proficiency on the TAKS improved from 40% to 56% and from 16% to 60%, respectively, mirroring the overall findings for these grade levels. While the overall percentage of ninth-grade students achieving Proficiency increased (Graph 1), TAKS reading proficiency level for ninth graders with disabilities remained the same from 2008 to 2009 (30%) (Graph 2). SRI results revealed similar trends in reading performance for students in all three school levels. Upper elementary, middle, and high school students gained 1.9, 1.8, and 2.5 grade levels, respectively (Graph 3). Findings also indicated that, on average, 76% of elementary students and 69% of middle and high school students demonstrated 1.0 or more years of reading growth on SRI. READ 180 students in Deer Valley make significant gains on Arizona state test. Deer Valley Unified School District (DVUSD), located in central Arizona, serves approximately 36,000 students in 37 schools, nine of which receive Title I funding. At the time of the study, 60% of READ 180 students in DVUSD were male, 47% were students with disabilities, and 26% were English language learners (ELL). Sixty percent were Caucasian, 31% were Hispanic, 4% were African American, 2% were Asian, 2% were Native American, and less than 1% were Native Hawaiian. DVUSD adopted READ 180 to improve the reading skills of elementary and middle school students who performed at the Falls Far Below or Approaching reading standard on the Arizona’s Instrument to Measure Standards (AIMS) and who also performed poorly on SRI, a measure of reading comprehension. Additionally, students with a reading disability were placed into READ 180. 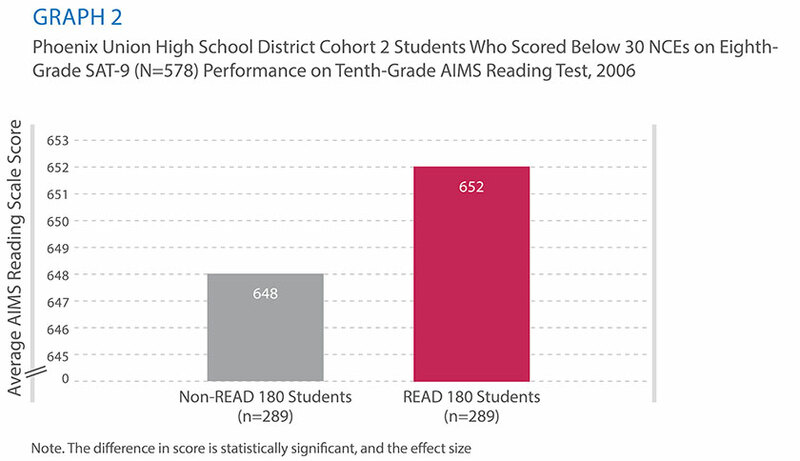 AIMS Reading test and SRI scores for 1,036 READ 180 students were obtained during the 2010–2011 school year. 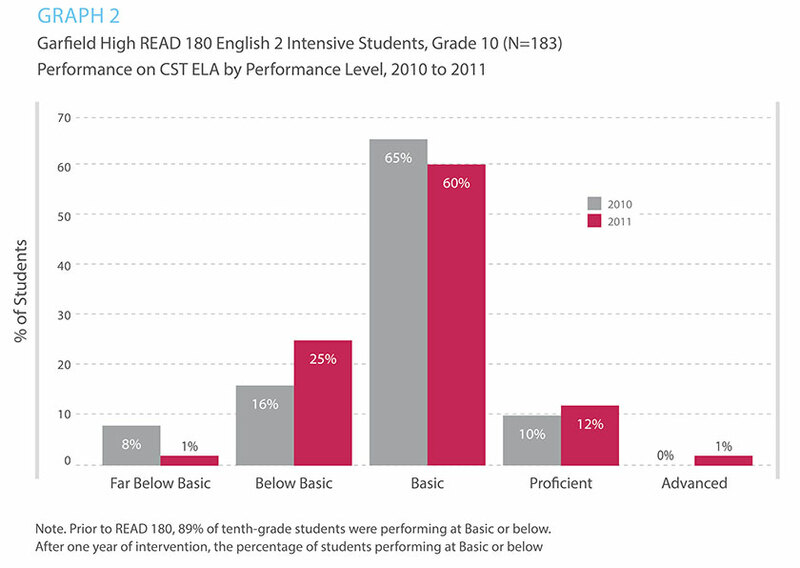 Findings show that after one year of READ 180, students demonstrated significant gains on the AIMS Reading test (Graph 1). Overall, the percentage of READ 180 students meeting the standard increased significantly from 9% in 2010 to 42% in 2011. Students in the fifth and sixth grades made the largest improvements, with the percentage of students meeting or exceeding the standard increasing by 38% and 45%, respectively. When the results were disaggregated by students with disabilities and ELLs, these significant positive trends continued (Graph 2). The percentage of READ 180 students with disabilities meeting or exceeding the AIMS standard more than doubled—from 11% in 2010 to 27% in 2011. In addition, the percentage of READ 180 ELLs meeting or exceeding the standard increased substantially—from 6% in 2010 to 37% in 2011. Further disaggregation of this data indicated that all ethnic groups demonstrated significant increases in the percentage of students meeting or exceeding the AIMS standard from 2010 to 2011 (Graph 3). Consistent with the AIMS Reading test findings, READ 180 students evidenced significant gains in reading comprehension on SRI during the 2010–2011 school year. On average, READ 180 students improved from a pretest score of 312 Lexile (L) measures to a posttest score of 556L, resulting in a statistically significant gain of 243L. When the data were disaggregated by grade, all grades achieved significant Lexile gains that exceeded annual growth expectations. In addition, students with disabilities, ELLs, and all ethnic groups demonstrated significant Lexile gains from 2010 to 2011. 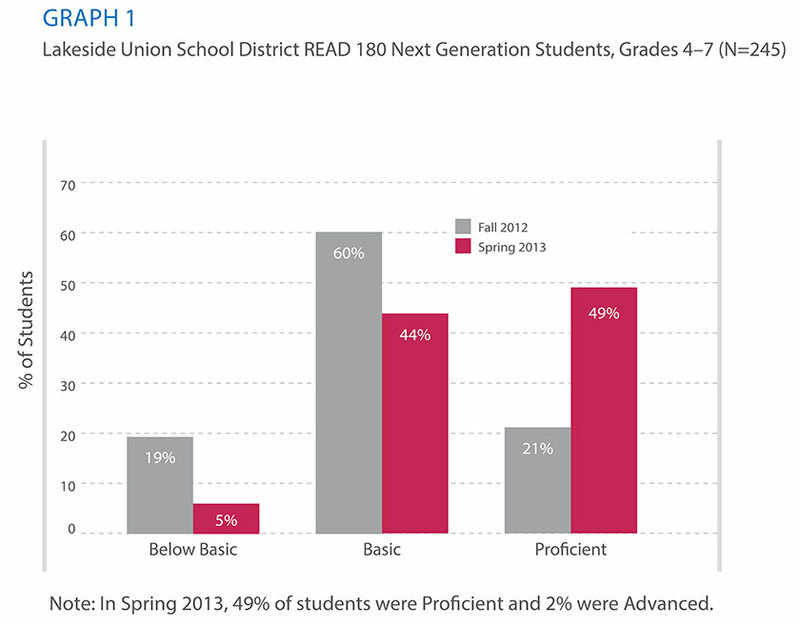 READ 180 Next Generation instruction results in significant fall-to-spring gains in reading achievement. A total of 337 students who participated in READ 180"Joplin School District enrolled 7,785 students in Grades Pre-K through 12 in 2011. During the 2011–2012 school year, students from seven elementary schools, three middle schools, and one high school in Joplin School District were selected to participate in a partnership with READ 180 Next Generation (NG). Of the READ 180 NG students, 74% were Caucasian, 10% were African American, 9% were Hispanic, 3% were Asian, 2% were Native American, and 2% were multiracial. Half of the students (50%) were students with disabilities, 5% were English language learners (ELL), and 76% received free or reduced-price lunch. READ 180 NG students experienced a significant average fall-to-spring Lexile gain of 232L, with 80% of students meeting or exceeding their individual yearly Lexile growth expectations (Graph 1). When broken down by grade, the Lexile gains experienced by Grades 4 through 9 were significant (the third-grade sample was too small to analyze statistically). Sixty-four percent of ninth graders met or exceeded their individual yearly Lexile growth expectations, as did 80% of eighth graders, 82% of seventh graders, 80% of sixth graders, 86% of fifth graders, 62% of fourth graders, and 83% of third graders. Students with disabilities experienced a significant average fall-to-spring Lexile gain of 200L (Graph 2). Sixty percent of students with disabilities met or exceeded their individual yearly Lexile growth expectations, as did 88% of general education students. Across the grades, students used the software an average of 30.7 hours over the year. An average of 103 sessions took place during this time, which resulted in the completion of 17 segments. It took students approximately 1.8 hours, or 6 sessions, to complete a segment. As Graph 3 displays, students who completed more software segments demonstrated greater Lexile gains than students who completed fewer segments. READ 180 Next Generation students in Lakeside Union School District experience significant improvement on The Reading Inventory. Lakeside Union School District (LUSD), located in East San Diego County, CA, enrolls approximately 5,000 students in kindergarten through eighth grade in seven elementary schools and two middle schools. The district enrollment is approximately 62% White, 28% Hispanic, 2% African American, 2% American Indian or Alaska Native, 1% Asian, 1% Filipino, 1% Pacific Islander, and 4% two or more races. Approximately 47% of the district enrollment consists of low-income students, 5% English learners, and 4% redesignated English fluent students. LUSD began implementing READ 180 Next Generation (NG) and System 44 during the 2011–2012 school year with the goal of supporting their struggling students. LUSD adopted System 44 for the 2013–2014 school year. LUSD implements READ 180 NG and System 44 as a multitiered, blended learning model during an English Language Arts block that lasts for at least 90 minutes daily in elementary schools. One middle school uses READ 180 stand-alone as an elective for a 50-minute period of two rotations—instructional software and independent reading only. A second middle school utilizes a 90-minute multitiered, blended learning model with READ 180 NG and System 44. A total of 245 students in Grades 4–7 who were enrolled in READ 180 NG during the 2012–2013 school year and 224 students in Grades 4–8 who were enrolled in READ 180 NG during the 2013–2014 school year were included in this evaluation. All students completed The Reading Inventory as a pretest during the fall and as a posttest during the spring. During the 2012–2013 school year, on average, students completed a total of 67 READ 180 NG sessions and 3.1 sessions per week. The following year, on average, students completed a total of 67 READ 180 NG sessions and 2.8 sessions per week. 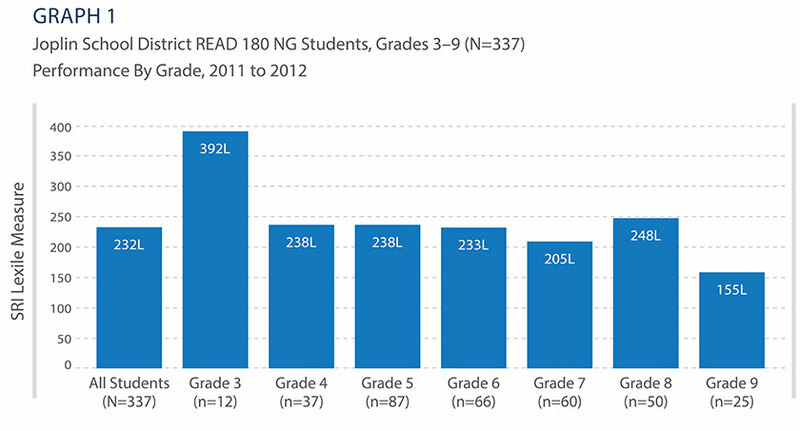 During the 2012–2013 school year, students demonstrated a significant average Lexile gain of 131L on The Reading Inventory from 562L at pretest to 693L at posttest. Sixty-two percent of students exceeded average annual growth from fall to spring. Students showed forward momentum in change in performance band status over the course of the year. There was a 14% decrease in the number of students at the Below Basic level at the end of the year, a 16% decrease in the number of students at the Basic level at the end of the year, and a 28% increase in the number of students at the Proficient level at the end of the year. See Graph 1. 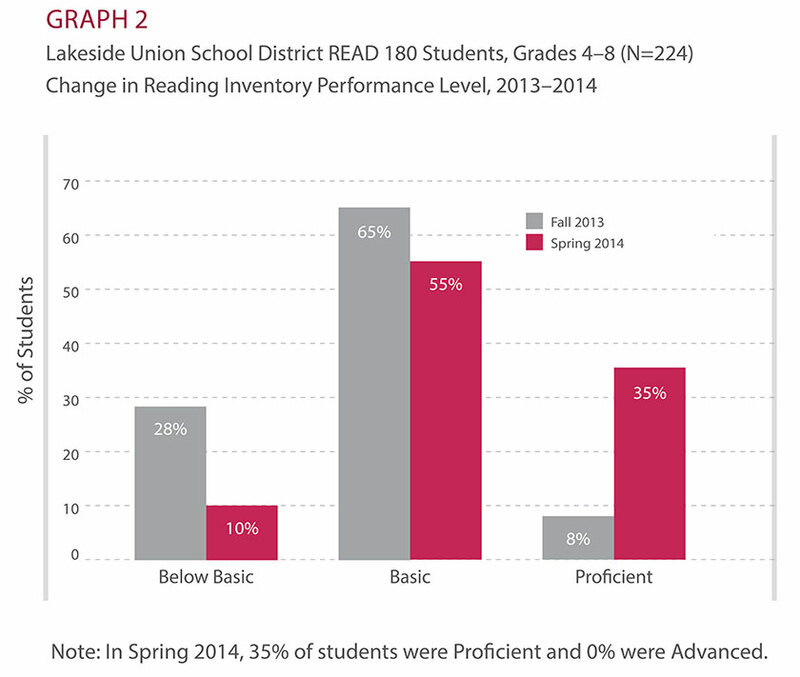 During the 2013–2014 school year, students demonstrated a significant average Lexile gain of 145L on The Reading Inventory from 522L at pretest to 667L at posttest. Sixty-three percent of students exceeded average annual growth from fall to spring. Students showed forward momentum in change in performance band status over the course of the year. There was an 18% decrease in the number of students at the Below Basic level at the end of the year, a 10% decrease in the number of students at the Basic level at the end of the year, and a 27% increase in the number of students at the Proficient level at the end of the year. See Graph 2. The Reading Inventory gains experienced by READ 180 NG students in Lakeside Union School District demonstrate the efficacy of READ 180 for accelerating students toward grade-level proficiency in reading. In both years of this evaluation, significantly more students scored Proficient on The Reading Inventory in the spring than had scored Proficient in the fall. By implementing READ 180 NG in elementary schools and middle schools with fidelity, LUSD has helped set their struggling readers on a path for success in school, college, and career. READ 180 students in elementary, middle, and high schools achieved gains across the board on the MCAS ELA and NWEA MAP assessments. 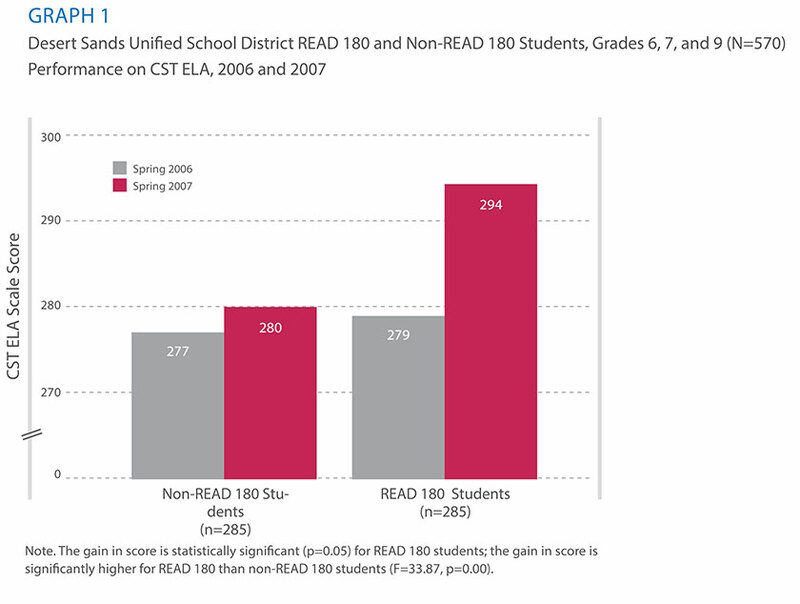 Lawrence Public Schools (LPS) began using READ 180 with nine schools in the 2005–2006 school year. By the 2008–2009 school year, 15 schools (nine elementary and middle schools, and six high schools), 38 classes, 34 teachers, and 513 students were using READ 180. More than half (53%) were general education students, 32% were students with disabilities, 12% were English language learners (ELL), and 4% were both ELL and had a disability. The majority, 83%, of READ 180 students were in the fourth through eighth grades. Upon conclusion of the 2008–2009 school year, the Office of Assessment and Accountability in LPS gathered numerous data sources to compile a comprehensive picture of READ 180 students’ literacy achievement. Findings from the analysis were summarized by Scholastic Research (2010) for 426 students enrolled in READ 180 who had both pretest and posttest data during the 2008–2009 school year. 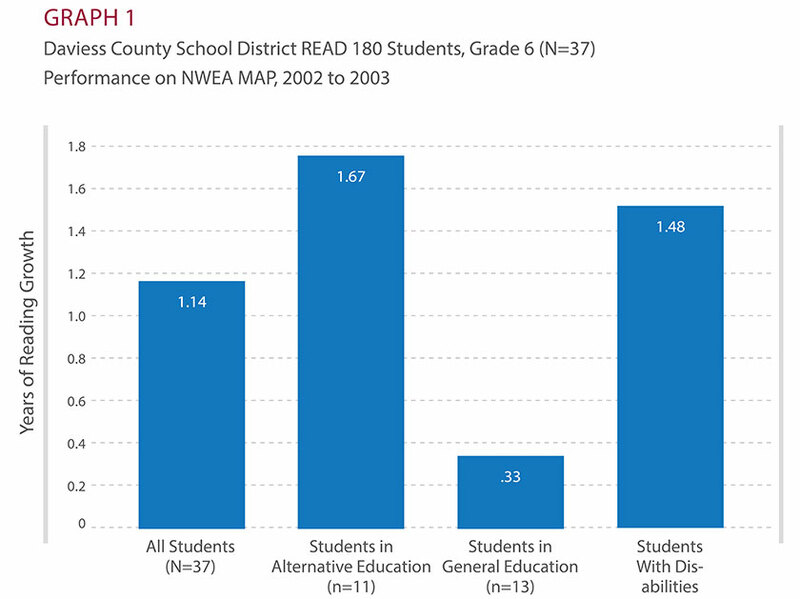 Data from the Massachusetts Comprehensive Assessment System English Language Arts (MCAS ELA) and Northwest Evaluation Association Measures of Academic Progress (NWEA MAP) were collected from READ 180 students during the 2008–2009 school year. 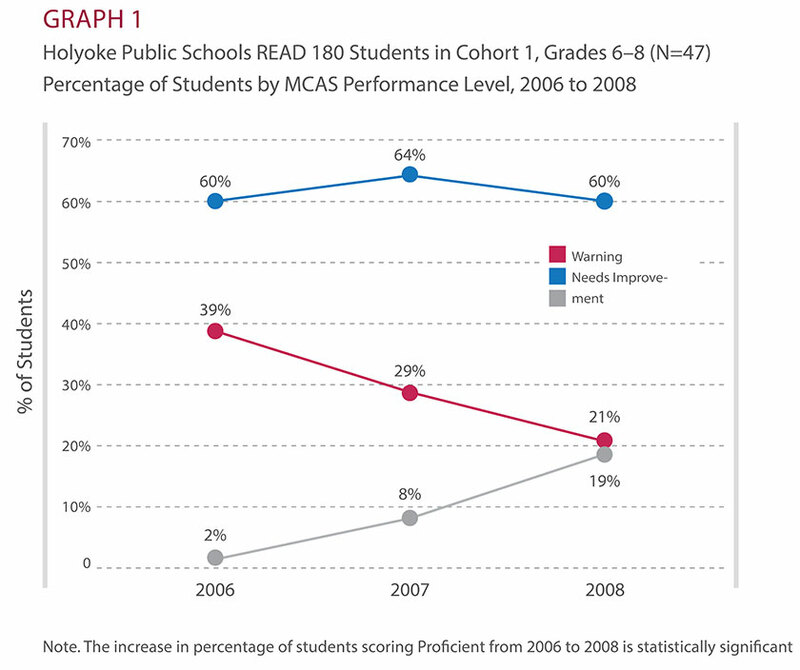 Findings show READ 180 students demonstrated measurable gains on the MCAS ELA from 2008 to 2009. 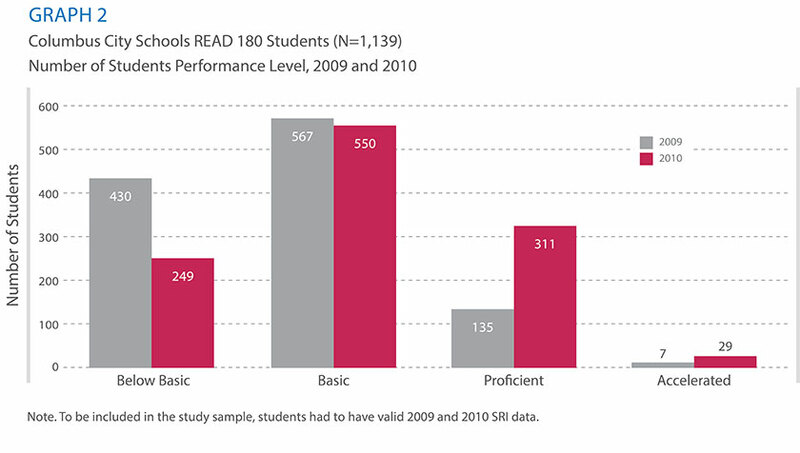 Overall, 50% of all READ 180 students increased their Performance Level by more than one category. Students in the fifth and seventh grades made the largest improvement, with 58% of fifth graders and 63% of seventh graders increasing their scores by at least one Performance Level (Graph 1). When the data were disaggregated by educational classification, these positive trends continued. Just over half (55%) of general education students improved their Performance Level on the MCAS ELA; similarly, nearly half of the students with dual classifications (disability and ELL) increased at least one Performance Level from 2008 to 2009 (Graph 2). Using historical MCAS and NWEA MAP data, the Office of Assessment and Accountability in LPS-aligned MAP Rasch Unit (RIT) scores with the MCAS Performance Levels. RIT scores are used to calculate yearly expected growth targets on NWEA MAP in order to meet MCAS performance benchmarks. Student performance on NWEA MAP is then labeled as falling below the target (Below Target), meeting the target (Met Target), or scoring above the target (Above Target). Results from the 2009 MAP revealed that READ 180 general education and ELL students made the greatest progress over the course of the year, with 67% and 56% meeting or exceeding the target, respectively. Performance improvements trailed closely behind for students with disabilities and students with dual classifications (disability and ELL), with 53% and 50% meeting or exceeding the target, respectively (Table 1). 70% of students exceed average annual growth from fall to spring after using READ 180. Lodi Unified School District (LUSD), located in San Joaquin County, CA, is a Pre-K to Adult district that enrolls approximately 30,000 students. There are 33 elementary schools, seven middle schools, four comprehensive high schools, and two continuation high schools. In addition, the district offers elementary and middle community day schools and several alternative schools to serve their preschool through adult population. LUSD adopted READ 180 Next Generation (NG) beginning in the 2011–2012 school year for Grades 7–12 and expanded to Grades 4–12 for the 2012–2013 school year. The district placed struggling readers beginning in the third grade in a 45–60 minute System 44 class. In Grades 4–12, the teachers implement a 90-minute model that blends READ 180 NG and System 44 NG instruction. The district has invested in providing ongoing support for teachers and administrators via coaching days and monthly cadre meetings. * The coaching days are used to strengthen the implementation of the programs, and the cadre meetings provide additional support to ensure that best practices are being used to positively affect student achievement. For the 2012–2013 school year, 87% of the students participating in the study were receiving free or reduced-price lunch, 61% were English learners, and 22% were students with disabilities. For the 2013–2014 school year, 87% of the students participating in the study were receiving free or reduced-price lunch, 55% were English learners, and 29% were students with disabilities. *A cadre is a group of trained READ 180 and System 44 educators joining together to expand their knowledge. Cadre meetings allow teachers to network and learn from each other, and are facilitated by expert Literacy Solutions consultants. During the 2012–2013 school year, on average, students completed a total of 99 READ 180 Universal sessions at approximately three sessions per week. After one year of instruction, students demonstrated a significant mean Lexile gain of 139L: the average score increased from 574L at pretest to 713L at posttest. 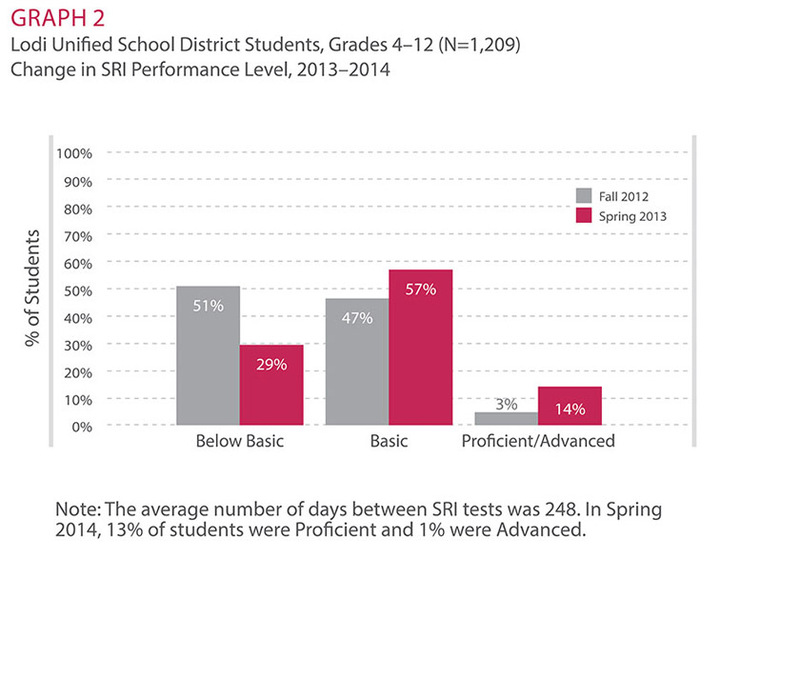 Seventy percent of students exceeded average annual growth on SRI from fall to spring. Students showed forward momentum in change in performance band status over the course of the year. In particular, there was a 26% decrease in the number of students at the Below Basic level and 10% increase in the number of students at the Proficient level at the end of the year. See Graph 1. During the 2013–2014 school year, on average, students completed a total of 99 READ 180 NG sessions at three sessions per week. After one year of instruction, students demonstrated a significant mean Lexile gain of 119L: the average score increased from 571L at pretest to 690L at posttest. Sixty-one percent of students exceeded average annual growth from fall to spring. Students also showed forward momentum in change in performance band status over the course of the year. There was a 22% decrease in the number of students at the Below Basic level and a 10% increase in the number of students at the Proficient level at the end of the year. See Graph 2. Due to the successful outcomes from implementing READ 180 NG and System 44 NG during the prior two school years, LUSD expanded this multitiered intervention to serve students with disabilities in Grades 4–6 during the 2014–2015 school year. Nearly twice as many READ 180 participants scored at or above grade level on the NY ELA as compared with their nonparticipating peers. During the 2001–2002 school year, New York City Community School District 23 (CSD23) implemented READ 180 with students in Grades 4–8. The program was so successful that the district added Grade 3 in the 2004–2005 school year. PSA obtained New York English Language Arts (NY ELA) test scores for 617 READ 180 students as well as from a comparison group of 4,619 peers during the 2001–2002 school year. READ 180 participants averaged larger scale score gains on the NY ELA exam from the spring of 2001 to the spring of 2002 than did nonparticipants. READ 180 participants gained an average of 17.4 scale score points, while nonparticipants in the same schools and grades gained an average of 14.8 scale score points. The difference is statistically significant (Graph 1). Similarly, while READ 180 African American participants gained an average of 17.2 scale score points on the NY ELA exam from spring 2001 to spring 2002, their nonparticipating African American peers averaged a gain of 14.9 points (Graph 2). In addition, among CSD23 students who scored below grade level (Proficiency Levels 1 and 2) on the spring 2001 NY ELA, a larger proportion of READ 180 participants than nonparticipants scored at or above grade level a year later on the spring 2002 NY ELA (21% and 11%, respectively). This difference was statistically significant (Graph 3). Students with disabilities demonstrate significant improvement on TAKS after one year of READ 180. San Antonio Independent School District (SAISD) is the 13th largest district in Texas, with an enrollment of 55,400 students in Grades Pre-K through 12. SAISD began using READ 180 with its high school students in the fall of 2006 and with its elementary and middle school students in the fall of 2009. During the 2010–2011 school year, SAISD implemented READ 180 in 32 elementary, middle, and high schools across the district as an intervention for struggling readers. Selection criteria for participation in the READ 180 program included disability status, Texas Assessment of Knowledge and Skills (TAKS) proficiency level, dyslexia diagnosis, and Response to Intervention (RTI) referral for a Tier 2 or Tier 3 intervention. Although a wider sample of students was selected for READ 180 in the district, this report focuses on outcomes for READ 180 students with disabilities only. Of these students, 67% were male, 96% received free or reduced-price lunch, and 26% were classified as English language learners (ELL). READ 180 was implemented as a supplemental intervention in addition to the core English Language Arts (ELA) curriculum for these students. A total of 663 students with disabilities were included in the analytic sample: 473 (71%) with specific learning disability; 75 (11%) with other health impairment; 60 (9%) with emotional disturbance; and 55 (9%) with different disability subcategories. Data from TAKS and SRI were used to measure student achievement for the group. 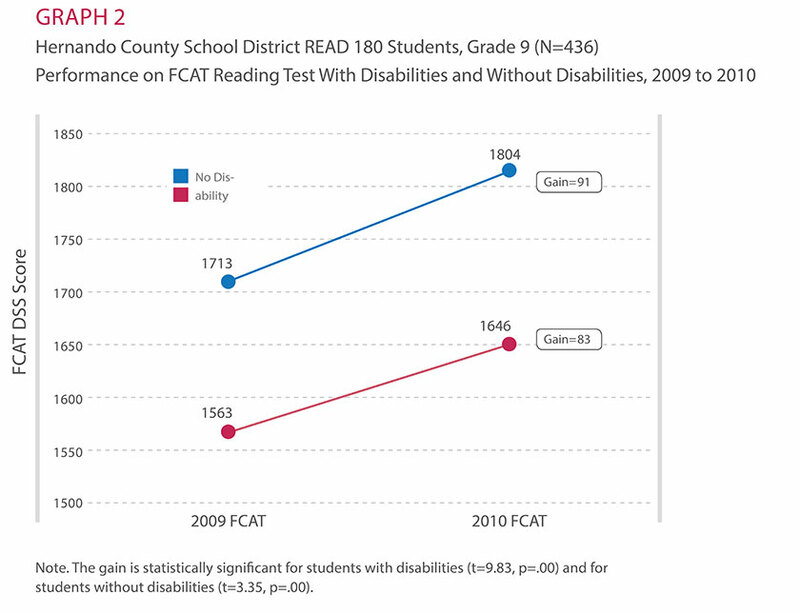 Data indicated that, on average, students with disabilities enrolled in READ 180 demonstrated improvements in their reading performance (Graph 1). Overall, the READ 180 students with disabilities made a significant gain in their TAKS Reading test passing rate, from 56% meeting or exceeding the standard in 2010 to nearly three-quarters of students (70%) in 2011. When TAKS results were analyzed for individual disability classifications, students in each major category also demonstrated significant improvements. Students classified as having a specific learning disability or other health impairment achieved average gains of 12 percentage points and 18 percentage points, respectively. Students classified as having an emotional disturbance demonstrated a particularly large average improvement of 23 percentage points. The students with a different disability subcategories sample was too small to allow for statistical tests. 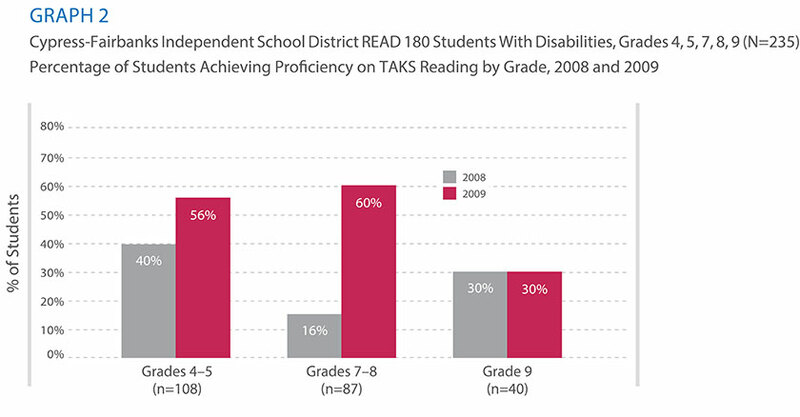 Additional analyses on the sample of students who did not meet the standard for passing the TAKS in 2010 revealed that more than half of students with disabilities (56%) passed TAKS after receiving one year of READ 180. Analyses revealed that READ 180 students with disabilities also demonstrated significant improvements in performance on SRI (Graph 2). 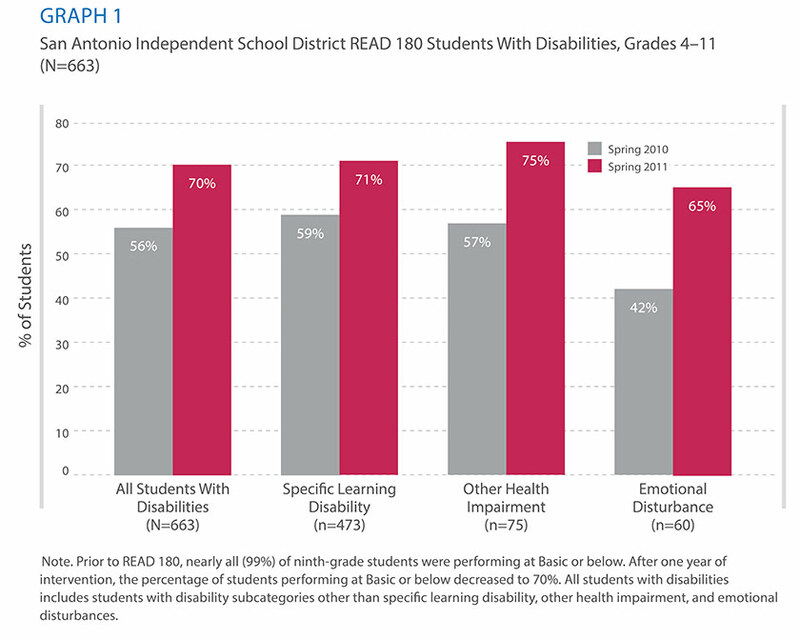 Overall, students with disabilities in SAISD gained an average of 92 Lexile (L) measures. These results were replicated within each disability subcategory that was analyzed; significant average gains were found for students who were classified as having learning disabilities (92L), other health impairment (101L), and emotional disturbance (108L). The significant gains in achievement on SRI were also evident across grade levels. 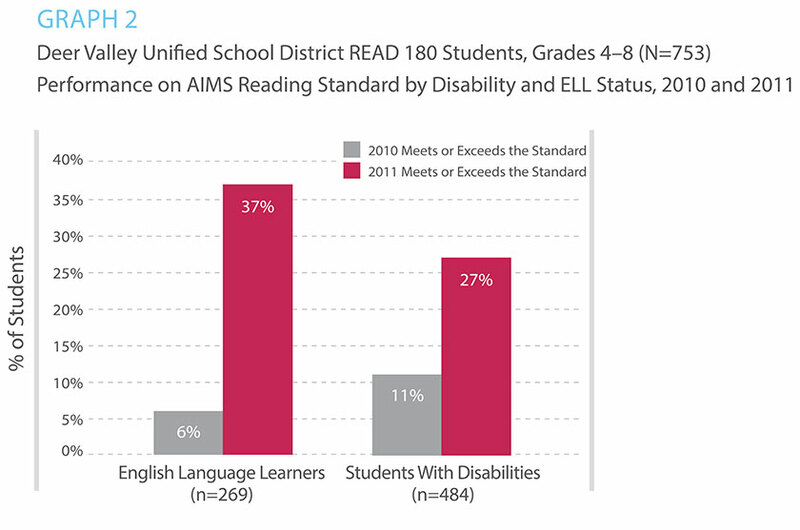 In the sample of READ 180 students with disabilities, elementary students gained an average of 119L, middle school students gained an average of 92L, and high school students gained an average of 87L. READ 180 students outperformed their peers on the TCAP reading and math assessments. During the 2004–2005 school year, Sevier County Public Schools (SCPS) in East Tennessee implemented READ 180 with academically at-risk fifth- and seventh-grade students who performed in the lowest quartile of the Tennessee Comprehensive Assessment Program (TCAP). Of the 113 students participating in SCPS’s READ 180 program, 33 were in fifth grade and 80 were in seventh grade. Fifty-nine percent of the sample were male, and 72% were classified as economically disadvantaged. The ethnic demographics of the READ 180 sample were representative of that of the district population, which was predominately Caucasian (94%), with a smaller representation of Hispanic students (4%), African American students (1%), and students of other ethnicities (1%). Nave (2007) obtained TCAP Achievement Test scores from 113 READ 180 students, as well as from a comparison group of 47 nonparticipating peers. READ 180 participants exhibited significantly greater gains on the TCAP Reading and Language Arts test than their nonparticipating peers. 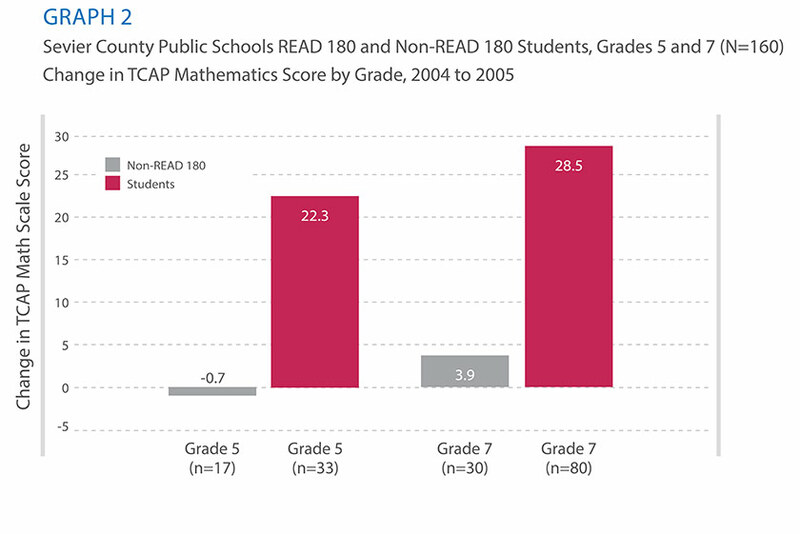 The performance for READ 180 fifth-grade students improved by 24.1 points on the TCAP Reading and Language Arts test, while the performance for the comparison group declined by an average of 2 points (Graph 1). Similarly, READ 180 seventh-grade students gained an average of 23.9 points on TCAP, while the comparison group declined by an average of 8.3 points. 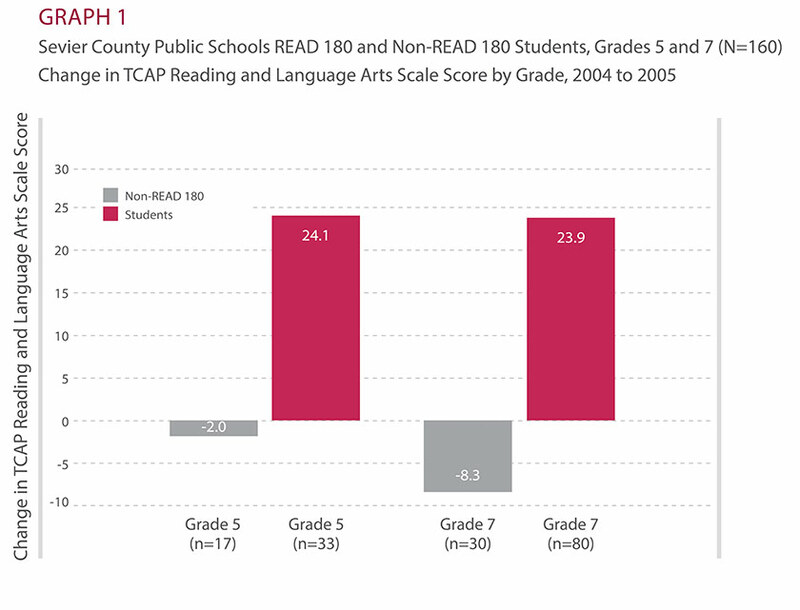 The difference in TCAP Reading and Language Arts performance between READ 180 students and the comparison group is statistically significant for both fifth- and seventh-grade students, with approximately 26% and 42% of the variance in these scores accounted for by READ 180, respectively. These improvements in performance for the READ 180 students were also apparent for fifth and seventh graders on the TCAP Mathematics assessment. READ 180 fifth-grade students gained, on average, 22.3 points, while the comparison group lost, on average, 0.7 points (Graph 2). Further, READ 180 seventh-grade students gained, on average, 28.5 points on the TCAP Mathematics test, while the comparison group gained, on average, 3.9 points. 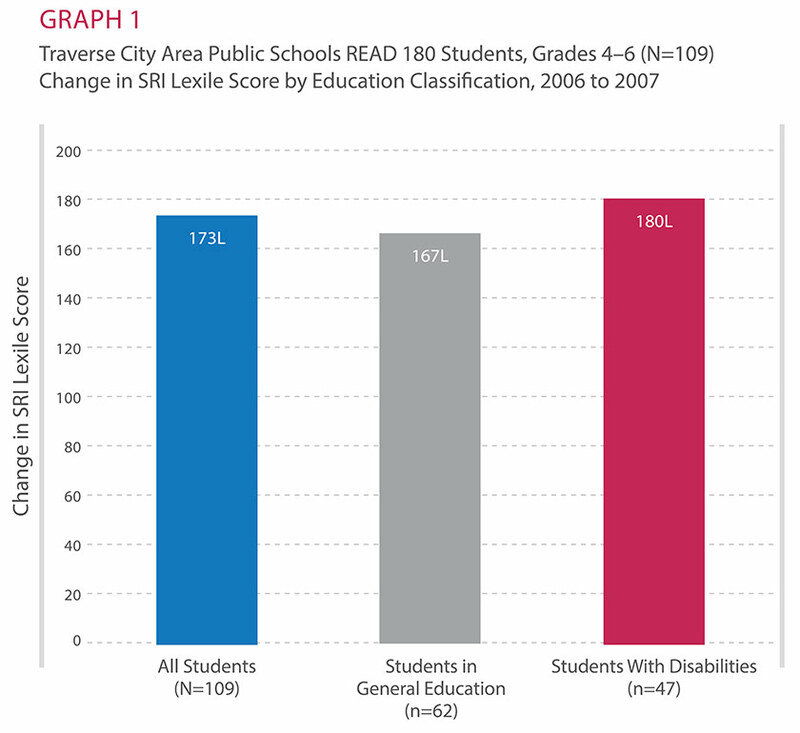 During the 2006–2007 school year, Traverse City Area Public Schools (TCAP) implemented READ 180 with its elementary students who scored within the first three stanines on the Degrees of Reading Power (DRP) test, or in Level 3 or 4 on the Michigan Educational Assessment Program (MEAP). Approximately 42% of the students in the sample were designated as students with disabilities, which included students who were diagnosed as having an emotional impairment (6%), a learning disability (25%), a physical and/or other health impairment (10%), and other (1%). Eighty-two percent were Caucasian, 10% were Hispanic, 9% were Native American, 3% were multiracial, 2% were Asian, and 1% were African American. In order to measure changes in reading skills, SRI data was obtained from 109 fourth, fifth, and sixth graders who used the program during the 2006–2007 school year. Findings indicate that this sample of READ 180 students demonstrated a significant gain of 173 Lexile (L) measures. Notably, when the results were analyzed by student group, students with disabilities made significant gains of 180L. These student gains were higher than those of the general education students on SRI (Graph 1). READ 180 students also exhibited improvements on the DRP. Overall, the 94 fifth and sixth graders who had valid pretest and posttest DRP scores averaged a statistically significant gain of 9.6 DRP units. Further, students with disabilities gained 9.1 DRP units from pretest to posttest. Both students with disabilities and general education students in READ 180 exceeded the annual growth expectation of 4 DRP units (Graph 2). Consistent with these findings, READ 180 students evidenced gains on the MEAP test, as well. As many as 65% of students who were reading at the Basic or Apprentice level on MEAP moved up one or more Performance Levels. 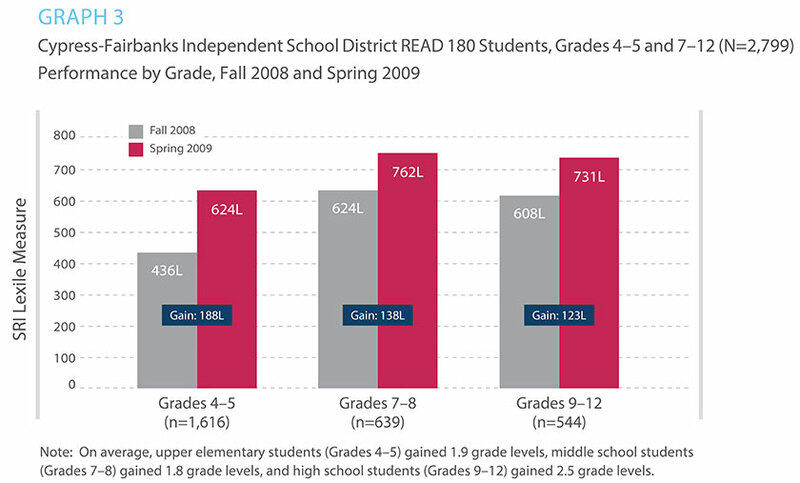 READ 180 students achieved greater gains on TAKS Reading than matched counterparts. In fall 2004, the Austin Independent School District (AISD) began using READ 180 to help struggling seventh and eighth graders become proficient readers. An independent research firm, Policy Studies Associates (PSA), studied the changes in reading proficiency achieved by READ 180 participants during the 2004–2005 school year (Haslam, White, & Klinge, 2006). AISD students selected to participate in READ 180 were either limited-English proficient (LEP) students, students with disabilities, or students performing below grade level on the Texas Assessment of Knowledge and Skills (TAKS) Reading test. Of the 343 seventh and eighth graders initially assigned to READ 180, 97.4% did not meet the statewide standard on TAKS prior to the intervention. In the sample of READ 180 students included in this analysis (N=307), approximately 89% were LEP and 3% were students with disabilities. The majority of students in the sample were Hispanic (94%), approximately 4% were African American, and 2% were Asian. 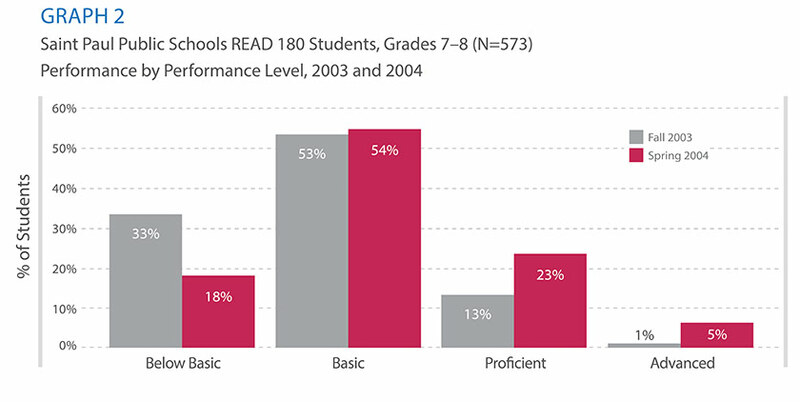 During the 2004–2005 school year, PSA examined the impact of READ 180 on the reading achievement of middle school students, as demonstrated by the TAKS Reading test. 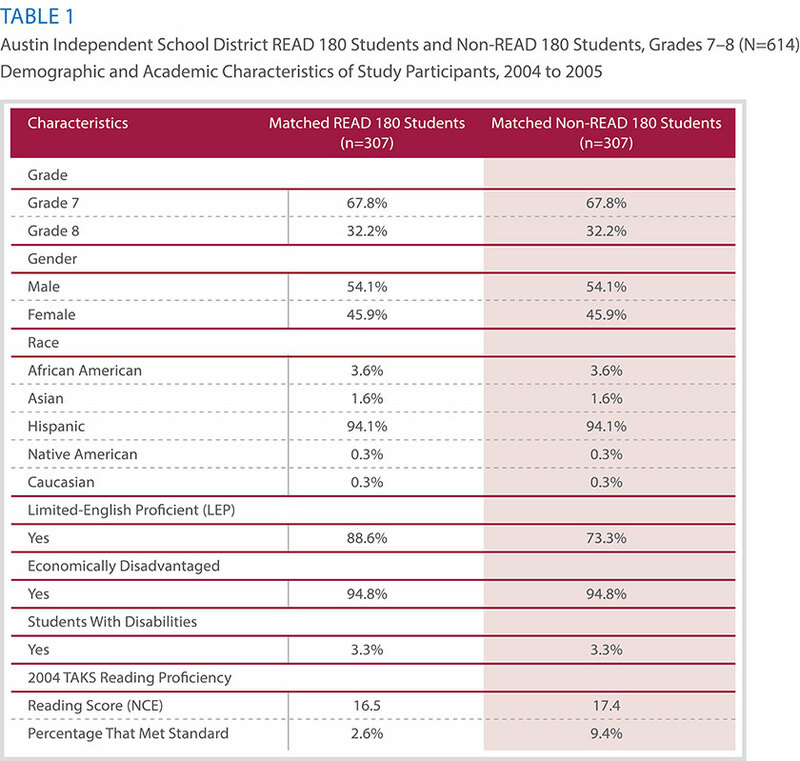 PSA used one-to-one propensity matching to identify a sample of students not participating in READ 180 whose characteristics closely matched those of READ 180 participants (Table 1). Exact matches were possible for grade, ethnicity, gender, free and reduced-price lunch eligibility, and disability classification. However, it was not possible to find an exact match based on 2004 TAKS Reading scores and LEP status. There was no statistically significant difference in 2004 TAKS Reading (pretest) between participants and nonparticipants. Findings indicate that READ 180 participants evidenced significantly greater gains on TAKS Reading from 2004 to 2005 than students in a matched comparison group of nonparticipants. 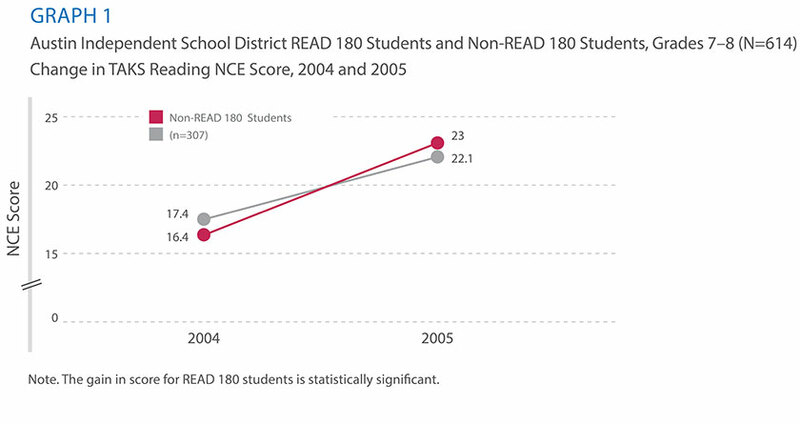 Specifically, the average score of READ 180 participants increased by 6.6 NCE points (+0.6). During the same period, the average TAKS score of the nonparticipants increased 4.7 Normal Curve Equivalent (NCE) points (+0.7) (Graph 1). Implementation: 52-minute model* *The READ 180 model dictates a 90-minute class, but the CCS district middle schools have 52-minute periods. To ensure that all program components are implemented, CCS splits the model over two days, including opening and closing whole-group instruction plus three rotations—small-group instruction, modeled and independent reading, and instructional software. READ 180 students demonstrated significant improvements in performance on the Ohio state test. The Columbus City Schools (CCS) district is large and diverse, serving more than 50,000 students at 77 elementary schools, 27 middle and alternative schools, and 24 high schools. Just over 80% of students come from economically disadvantaged backgrounds and the district experiences a high mobility rate (54.6% of students have been in the district for less than three years). For several years, struggling readers in kindergarten through fifth grade have received support from tutors and literacy specialists; however, no formal intervention was in place for those students once they arrived in middle school. To address this problem, CCS examined different intervention programs and selected READ 180 because of its strong match to their needs. In particular, CCS noted the critical importance of establishing ground knowledge, a hallmark feature of READ 180. In the fall of 2009, 1,158 sixth- and seventh-grade tudents in 24 middle schools were identified for placement into READ 180. Students were selected based on a combination of factors, including Ohio Achievement Assessment (OAA) score, Text Reading Comprehension (TRC) level, baseline Lexile score, and input from teachers and principals. Of the 1,158 READ 180 students with demographic data available, 48.6% were female and 51.4% were male, and the majority were in regular education (about 91.2%). This sample differs from the district as a whole in that there are a higher percentage of students with disabilities in the district than in this sample (about 17% compared to 6.2% in the READ 180 program). This report summarizes OAA findings as reported by the office of School Improvement and Federal Programs, Columbus City Schools (Scholastic Research, 2010). SRI findings were analyzed by Literacy Solutions, our professional services learning arm. Spring 2009 and spring 2010 OAA and SRI data were gathered from 1,060 CCS READ 180 students. Data indicate that from spring 2009 to spring 2010, the percentage of students scoring in the Proficient, Accelerated, and Advanced Performance Levels on the OAA increased. 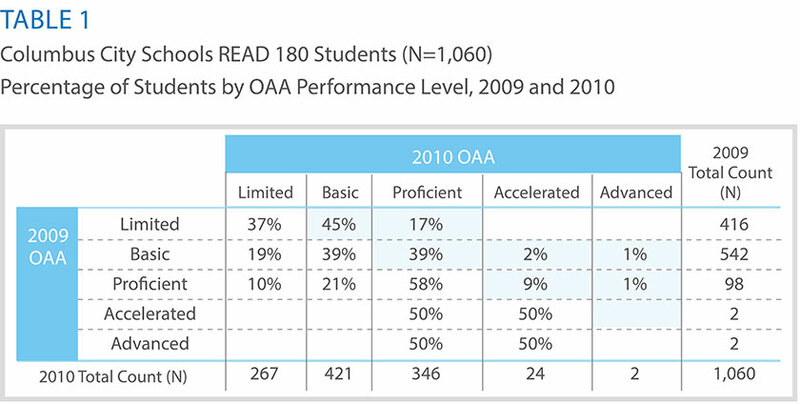 As Table 1 shows, among READ 180 students who scored in the Basic Performance Level on the OAA pretest, 42% reached the Proficient, Accelerated, or Advanced Performance Level after participation in the program (39% Basic, plus 2% Accelerated, plus 1% Advanced). In addition, 62% of students who scored in the Limited category prior to READ 180 moved up at least one Performance Level: 45% scored in the Basic Performance Level and 17% reached the Proficient Performance Level. Graph 1 displays these results by student count, demonstrating more than a threefold increase in the number of students scoring Proficient, Accelerated, or Advanced on the OAA after participation in READ 180. 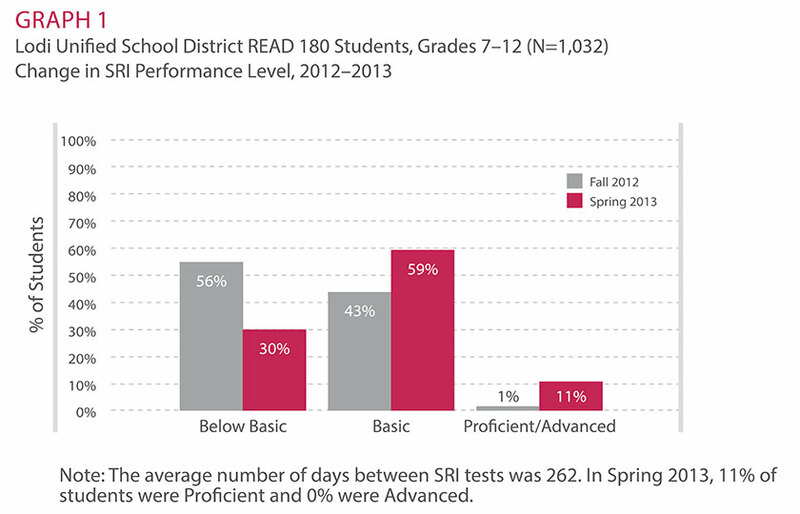 Consistent with these findings, the number of READ 180 students performing in the Proficient Performance Level on SRI increased from 135 to 311, or from 12% to 27% (Graph 2). Further, 62% of students achieved a year or more of reading growth (100 Lexile (L) measures is approximately equal to a year’s growth at Grades 3–5, 75L at Grades 6–8, and 50L at Grades 9–12). As a result of these successful findings, an additional READ 180 classroom was added in each middle school to serve eighth-grade students, and new part-time teachers were hired to meet the demand. The program was also expanded into three high schools within the district, funded by School Improvement Grants. READ 180 students in Boston, Houston, Dallas, and Columbus outperformed non-READ 180 students on the SAT-9. The Council of the Great City Schools (CGCS) is a national organization which represents the needs of urban public schools. One of CGCS’s primary goals is to ensure that America’s public schools are educating the nation’s most diverse student body to the highest academic standards. During the 2000–2001 school year, a study was conducted to examine the impact of READ 180 on the reading achievement of middle school students enrolled in seven urban school districts. Each district agreed to recruit two middle schools for the study. The research design called for each school to rank order their sixth- and seventh-grade students by reading ability, then randomly assign the lowest-ranked students to either a READ 180 class or a control group. A third-party research company, Interactive, Inc., monitored and evaluated the study implementation (Interactive, Inc., 2002). Four of the seven districts provided valid pretest and posttest student data. This report describes the impact of READ 180 on students who were enrolled in Boston Public Schools (BPS), MA; Columbus City Schools (CCS), OH; Dallas Independent School District (DISD), TX; and Houston Independent School District (HISD), TX. READ 180 was implemented in four middle schools in BPS, two in CCS, four in DISD, and two in HISD. Interactive, Inc. examined Stanford Achievement Test Series, Ninth Edition (SAT-9), reading test data for 881 students who had valid test scores from 2000 and 2001. Results were reported based on when the pretests and posttests were administered. Students in BPS, DISD, and HISD took the SAT-9 in spring 2000 and spring 2001. For all READ 180 students in these three districts, the difference in growth between the treatment and control groups (+22.94 and +17.24, respectively) was statistically significant and in favor of the students in the READ 180 classes (F=12.624, p=0.000). 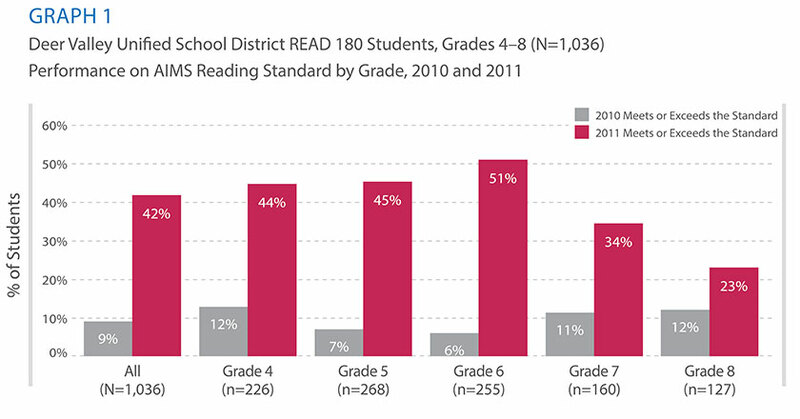 Graph 1 shows the differences in reading growth, broken down by district. In CCS, the pretest was administered in fall 2000, and the posttest was administered in spring 2001. The difference in the growth between the treatment and control groups (+14.4 and -3.8, respectively) was statistically significant and in favor of the students in the READ 180 classes (Graph 2). Using analysis of covariance (ANCOVA) to control for prior levels of achievement, the difference in the adjusted mean between the treatment (648.48) and control groups (642.42) was statistically significant and in favor of the students in the READ 180 classes (F=12.624, p=0.000). Further, survey and observational data were used to assess the quality of implementation in each participating classroom. 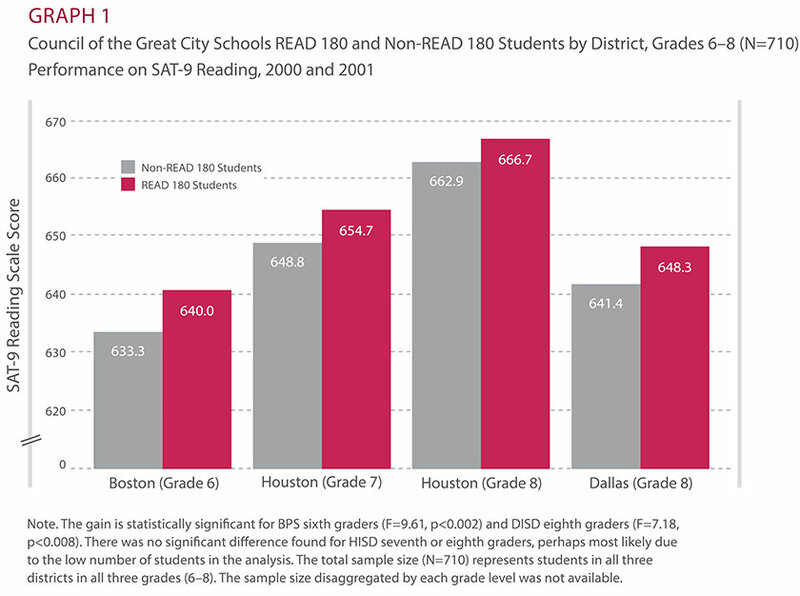 BPS, HISD, and CCS implemented READ 180 at both moderate and high-quality levels, while DISD had high-quality implementation. Findings indicated that students in both moderate- and high-quality implementation classrooms averaged significant gains of 27 points* and 22 points, respectively on SAT-9, compared to the average gain of 16 points by the control group. * Students in the moderate implementation classrooms had a significantly lower average pretest score than students in high implementation, and thus had a higher gain. The higher pretest score in the high-quality implementation group is likely due to DISD, which only implemented with 8th graders (rather than 6th or 7th graders), and where half of the high implementation classrooms were located. READ 180 students with disabilities exceeded yearly growth expectations on the SDRT-4. Desert Sands Unified School District (DSUSD), located on the outskirts of Palm Springs, enrolls nearly 29,000 students in Grades K–12. The district’s ethnic population was 64% Hispanic, 27% Caucasian, 2% African American, 1% Asian, and 6% unclassified. During the 2006–2007 school year, DSUSD implemented READ 180 to increase the reading achievement of sixth-, seventh-, and ninth-grade students performing at the Below Basic or Basic Performance Level on the California Standards Test of English Language Arts (CST ELA). More than half of the students were classified as English learners (58.2%). 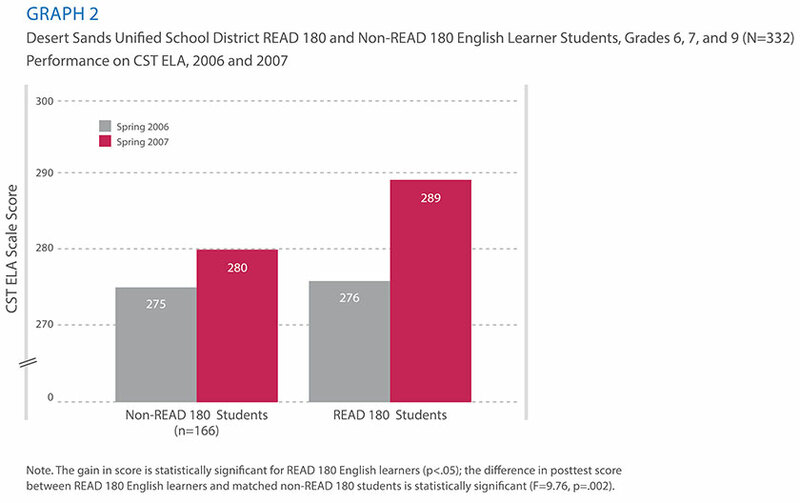 This study assessed the impact of READ 180 on student reading achievement. The spring 2006 and spring 2007 CST ELA scores from 285 READ 180 students and from a comparison group of 285 DSUSD students who were matched on spring 2006 CST ELA scores and language proficiency status were analyzed. As Graph 1 shows, findings revealed that READ 180 students achieved, on average, a pretest CST ELA scale score of 279 and a posttest score of 294, resulting in a statistically significant gain of 14.6 scale score points on the CST ELA. However, the comparison group achieved an average pretest score of 277 and a posttest score of 280 for a nonsignificant gain of 3 scale score points. An analysis of covariance (ANCOVA) revealed that the READ 180 student gains were significantly higher than matched peers, even after controlling for differences in their pretest CST ELA scores. The CST ELA scores from 166 READ 180 English learners and a separate comparison group of 166 nonparticipants were analyzed separately. An ANCOVA confirmed that READ 180 English learners had significantly higher 2007 CST ELA scores than did their matched nonparticipating peers, controlling for differences in their 2006 CST ELA scores. As Graph 2 shows, READ 180 English learners gained an average of 13 scale score points, while the comparison group gained, on average, 5 scale score points. 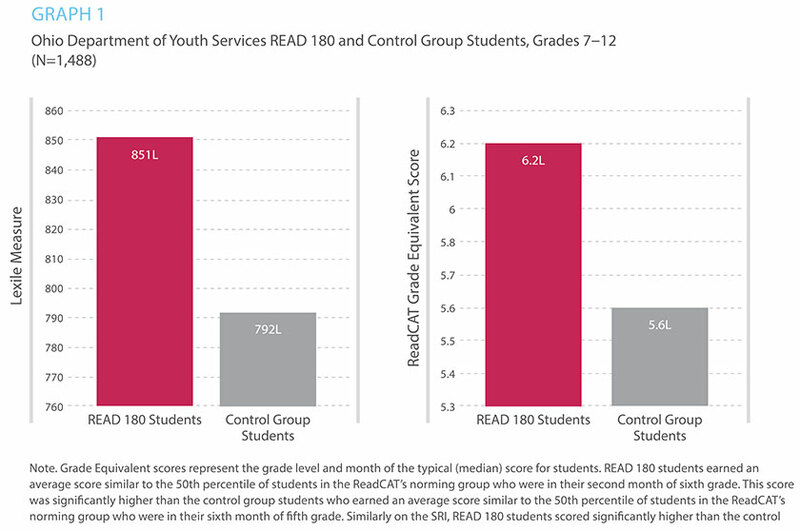 Although both groups’ gains were statistically significant, the READ 180 students’ gain was approximately 2.5 times larger. READ 180 English learners demonstrated CST ELA gains that were 2.5 times larger than their nonparticipating peers. Mixed-model READ 180 and System 44 middle school students outperform nonparticipating peers on Georgia Criterion-Referenced Competency Test. Effingham County Schools (ECS) includes 14 schools that serve 11,462 students in Grades Pre-K through 12. The mission of ECS is “to provide rigorous and relevant instruction in a safe environment to enable all students to obtain ... postsecondary success.” Of the approximately 55,000 people who live in Ef ngham County, 83% are Caucasian, 14% are African American, and 3% are either Hispanic/ Latino, Asian, or American Indian/Alaska Native. 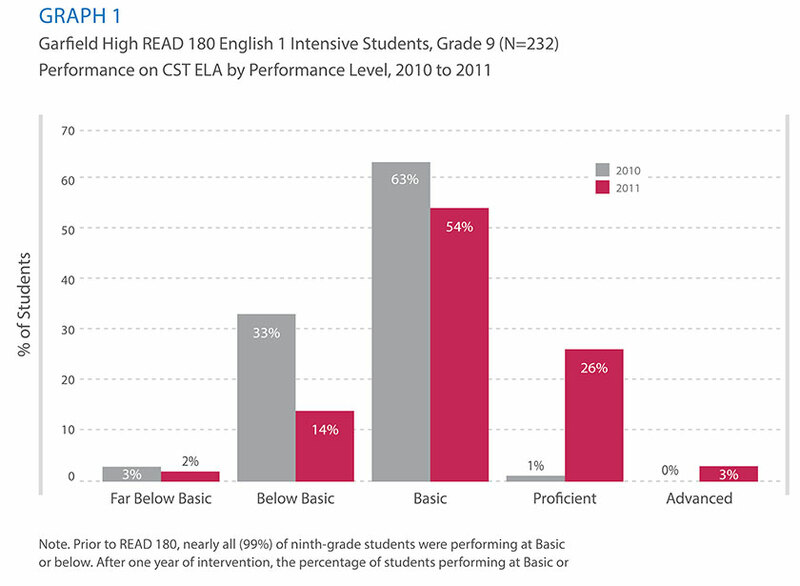 In the 2013–2014 school year, ECS implemented READ 180 Next Generation (NG) and System 44 Next Generation (NG) in their sixth- through ninth-grade classrooms as part of a Response to Intervention (RTI) model. Students identified as readers struggling with comprehension were placed into READ 180 NG, and students identi ed as readers struggling with foundational literacy skills were placed into System 44 NG. The two programs were implemented together within classrooms as part of a multitiered, blended learning model. All three middle schools in Ef ngham County participated in this study. In the READ 180 NG program, there were 81 sixth-grade students, 87 seventh-grade students, 67 eighth-grade students, and 37 ninth-grade students for a total of 272 students included in the study. As part of a mixed-model intervention, students received READ 180 NG Tier 2 or System 44 NG Tier 3 instruction daily, for 75 minutes in one middle school and for 55 minutes in two middle schools. 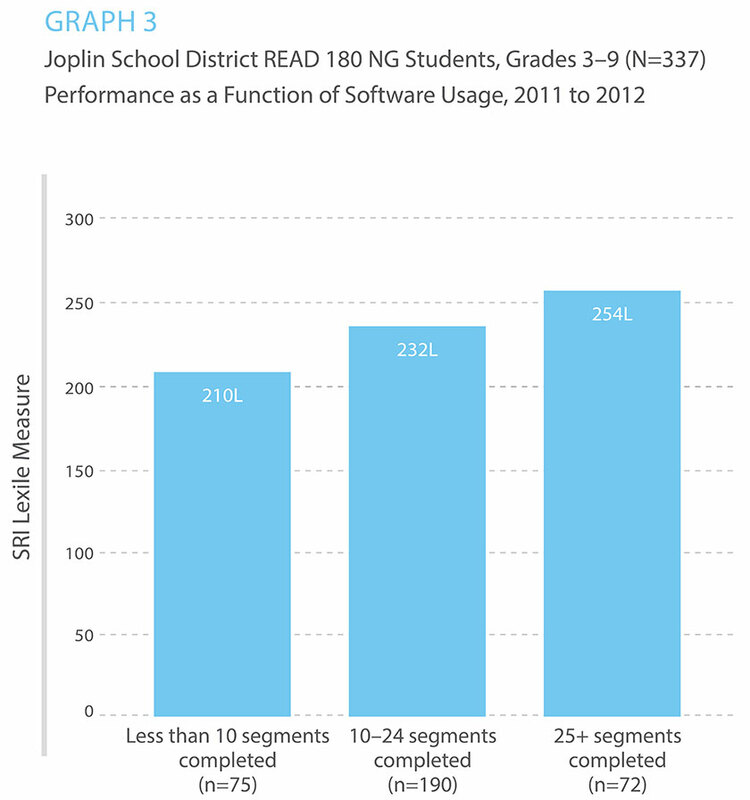 Across the grades, students used the READ 180 NG software an average of 28 hours over the year. An average of 94 sessions took place during this time, which resulted in the completion of 14 segments. 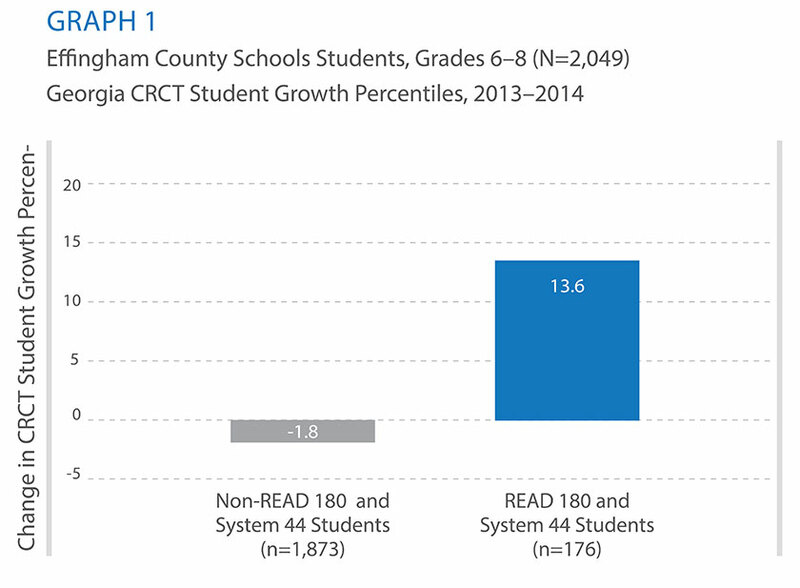 READ 180 NG and System 44 NG students outperformed their nonparticipating peers on the reading section of the Georgia Criterion-Referenced Competency Test (CRCT). Across the schools, 176 students enrolled in READ 180 NG or System 44 had an average SGP increase of 13.6 percentile points, whereas 1,873 non-READ 180 NG or System 44 students had an average SGP decrease of 1.8 points. See Graph 1. Overall, READ 180 NG students also experienced a signi cant average fall-to-spring Lexile gain of 148L on The Reading Inventory, with 77% of students exceeding average annual growth. Seventh and eighth graders had the greatest mean Lexile gains (168L for both, with 87% and 81% of students exceeding average annual growth, respectively), followed by ninth graders (128L, with 68% of students exceeding average annual growth) and sixth graders (128L, with 67% of students exceeding average annual growth). See Graph 2. 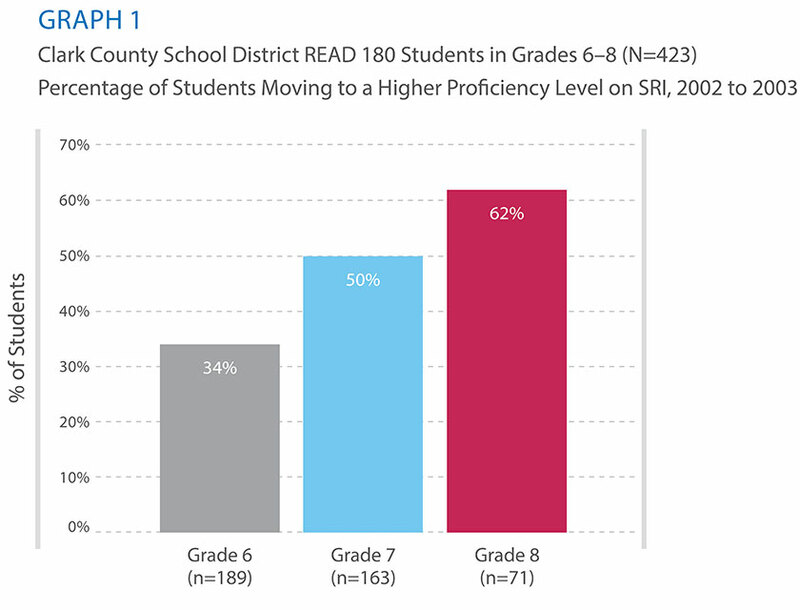 These results provide evidence that students who received READ 180 NG instruction as part of a mixed-model intervention made signi cant improvements on both proximal measures of reading achievement such as The Reading Inventory and distal measures of reading achievement such as the Georgia CRCT Reading. The percentage of READ 180 students achieving proficiency on the MCAS ELA increased nearly tenfold after two consecutive years of READ 180. Situated in one of the poorest communities in Massachusetts, Holyoke Public Schools (HPS) serves a population in which 76% of all students were economically disadvantaged. At the time of the study, the district population was largely Hispanic (76%), while the remaining students were mainly Caucasian (17%), African American (3%), Asian American (less than 1%), and multiracial (less than 1%). Twenty-four percent of students were identified as limited-English proficient (LEP), and a quarter were students with disabilities. In 2002, the HPS district was declared underperforming. To address its performance issues, HPS piloted READ 180 at one of its middle schools and an alternative education program site. The program was so successful that it was expanded into seven additional middle schools with the goal of replicating the district’s early success with a greater number of students. Beginning with the 2006–2007 school year, the READ 180 instructional model was modified to fit into a 70-minute period and was delivered daily in addition to students’ regular ELA classes. Students were selected for READ 180 if they were performing 2–4 years below grade level. Massachusetts Comprehensive Assessment System English Language Arts (MCAS ELA) and SRI data were collected and analyzed (Scholastic Research, 2009). READ 180 students in Cohort 1 (N=47) were enrolled in the program and remained in school with valid pretest and posttest data for two consecutive years (2006–2008). READ 180 students in Cohort 2 (N=197) were followed for only one year (2007–2008) due to high mobility rates in the district. Findings showed that the percentage of Cohort 1 students performing at the Proficient Performance Level on the MCAS ELA increased nearly tenfold (from 2% to 19%), while the percentage of students performing at the Warning Performance Level decreased by almost half (from 39% to 21%). 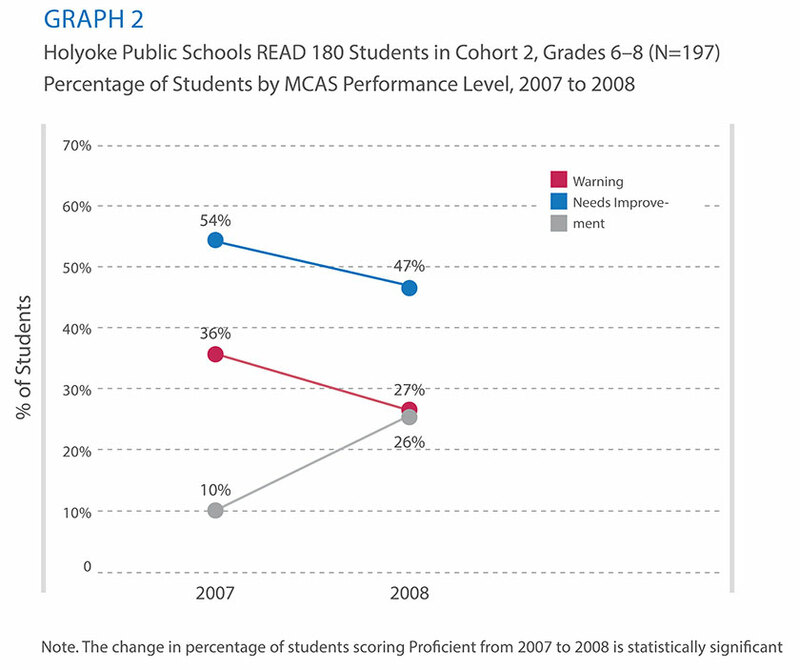 This positive change in MCAS Performance Level from 2006 to 2008 was statistically significant (Graph 1). 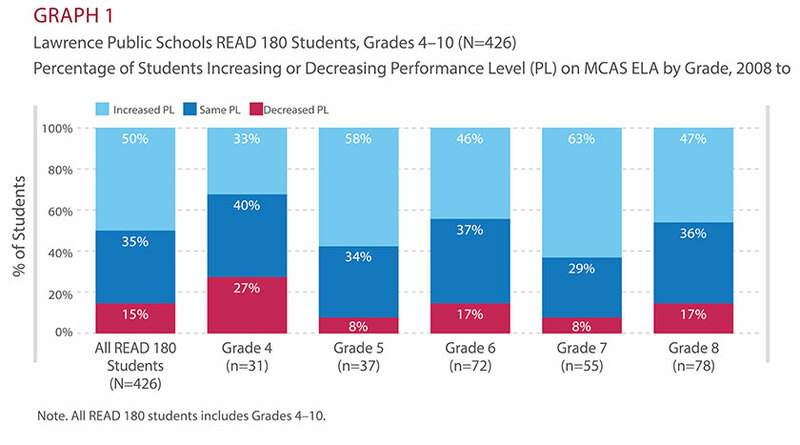 Among students with one year of READ 180 (Cohort 2), the percentage of students performing at the Proficient Performance Level on the MCAS ELA more than doubled, from 10% to 26%, while the percentage of students at the Warning Performance Level decreased from 36% to 27%. Dependent t-tests demonstrated that the percentage of students performing at the Proficient Performance Level was significantly higher in 2008 than it was in 2007 (Graph 2). READ 180 students also demonstrated impressive gains on SRI. Students in Cohort 1 achieved a statistically significant average gain of 147 Lexile (L) measures from 2006 to 2007 (t=5.87, p<001); and a statistically significant average gain of 90L from 2007 to 2008 (t=5.35, p<001);. Similarly, students in Cohort 2 achieved a statistically significant average gain of 125L from 2007 to 2008 (t=12.33, p<001). Moreover, both cohorts, on average, exceeded the expected fall-to-spring gain of 75L (as determined by the SRI normative sample). *The Delaware Comprehensive Assessment Program (DCAP) replaced DSTP in 2010. READ 180 students with disabilities closed the gap in reading performance. Located in Indian River School District (IRSD), Selbyville Middle School was identified as a school “Under Review” by the Delaware Department of Education during the 2001–2002 school year. This designation is based on low student performance on the Delaware Student Testing Program (DSTP)1, which places students into five performance levels (Well Below the Standard, Below the Standard, Meets the Standard, Exceeds the Standard, and Distinguished). In 2002, only 31% of IRSD students with disabilities in sixth through eighth grade met the standard on the DSTP Reading Test, as compared with 83% of all students. In order to decrease the achievement gap between general education students and students with disabilities, IRSD piloted READ 180 at Selbyville Middle School (Selbyville) during the 2003–2004 school year. Students performing in the bottom quartile on standardized assessments were selected to participate in READ 180. The program was so successful at improving the reading achievement for Selbyville’s struggling students that IRSD expanded READ 180 to sixth- through eighth-grade students at Sussex Central Middle School (Sussex Central). 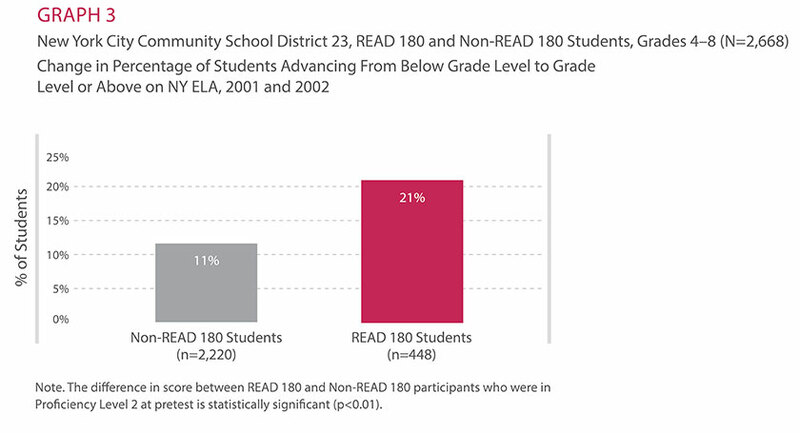 By the 2004–2005 school year,184 students were enrolled in READ 180. Of these, 84% were students with disabilities (Table 1). Pretest (spring 2004) and posttest (spring 2005) SRI data were collected for 184 students receiving READ 180. When the data were disaggregated by grade, sixth-, seventh-, and eighth-grade students achieved average Lexile (L) gains (153L, 217L, and 167L, respectively) that exceeded annual growth expectations. Typically, middle school students performing at the 25th percentile are expected to gain 75L each year on SRI. Based on the fall-to-spring norms on which SRI growth expectations are based, READ 180 students evidenced more than two years of reading growth (Graph 1). In addition, eighth-grade DSTP data were analyzed from 1998 to 2005. 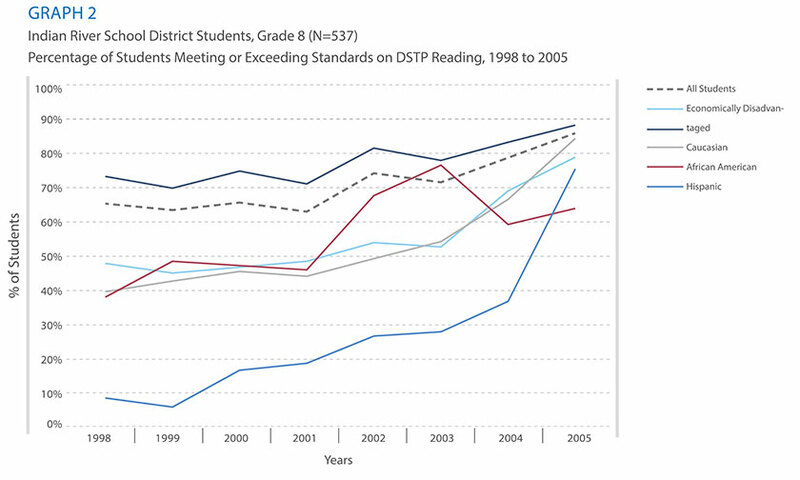 Findings show that in 2004, after READ 180 was implemented, greater percentages of eighth-grade students met or exceeded the standard on the DSTP. When the data were disaggregated by student group, findings show that eighth-grade students with disabilities showed greater improvement in DSTP performance than all students with disabilities did as a whole (Graph 2). Among eighth graders, the percentage of students with disabilities meeting or exceeding standards increased by 51 percentage points while the percentage of eighth-grade students as a whole increased by 7 percentage points. These data suggests that READ 180 students with disabilities, in making these large gains, have reduced the gap that existed between students with disabilities and other eighth-grade students on the DSTP. Two-thirds of READ 180 students at KIPP NYC doubled their expected annual average in growth in reading. During the 2014–2015 school year, 321 fifth- through ninth-grade students in all five of KIPP NYC’s middle schools and its one high school were selected to participate in a study of READ 180’s effectiveness. Students scoring Basic or Below Basic on The Reading Inventory were placed into READ 180 classrooms at KIPP NYC, where they were expected to receive 45 to 90 minutes of instruction five times per week. The model varied across the schools, with some classrooms using a stand-alone READ 180 Next Generation implementation and some classrooms using an integrated READ 180 Next Generation/System 44 Next Generation model. Data from NWEA MAP and The Reading Inventory were collected and analyzed for 321 students (59 fifth graders, 98 sixth graders, 85 seventh graders, 27 eighth graders, and 52 ninth graders) who used the program during the 2014–2015 school year. READ 180 students averaged 89 total sessions, at about three sessions per week. 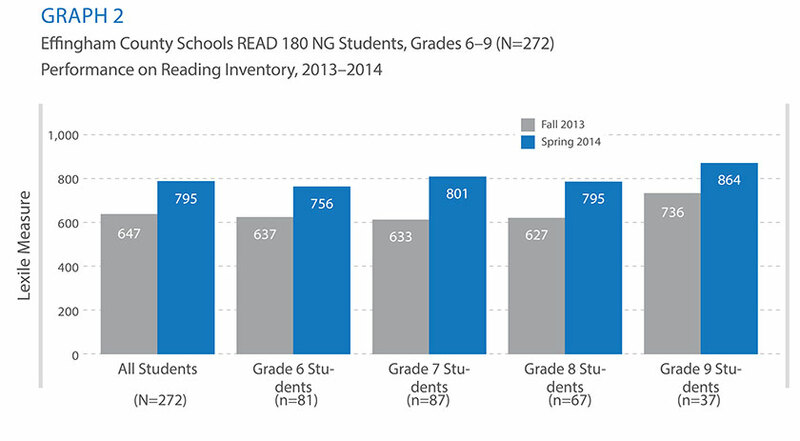 On average, students grew 163L on The Reading Inventory. Eighty-four percent of students met or exceeded annual average growth, and 65% of students met or exceeded two times their annual average growth. Students showed forward momentum in change in proficiency band status over the course of the year. 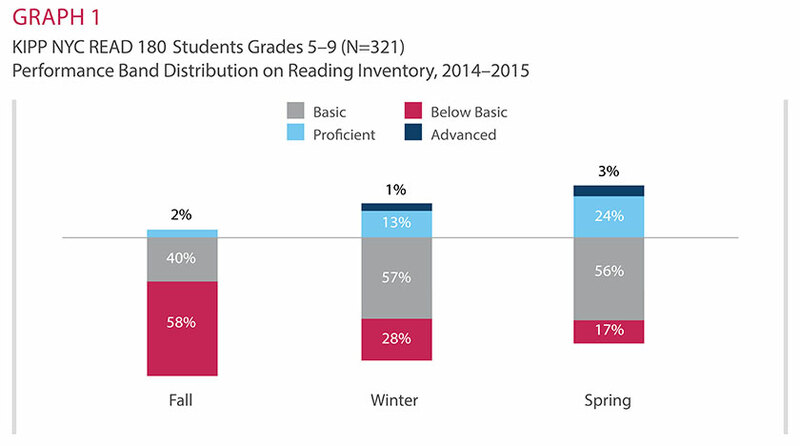 The percentage of students who scored Proficient or Advanced on The Reading Inventory increased significantly from 2% in the fall to 27% in the spring. See Graph 1. Students averaged a significant gain of 7 RIT points on MAP, with 70% of students meeting or exceeding typical fall-to-spring MAP growth. 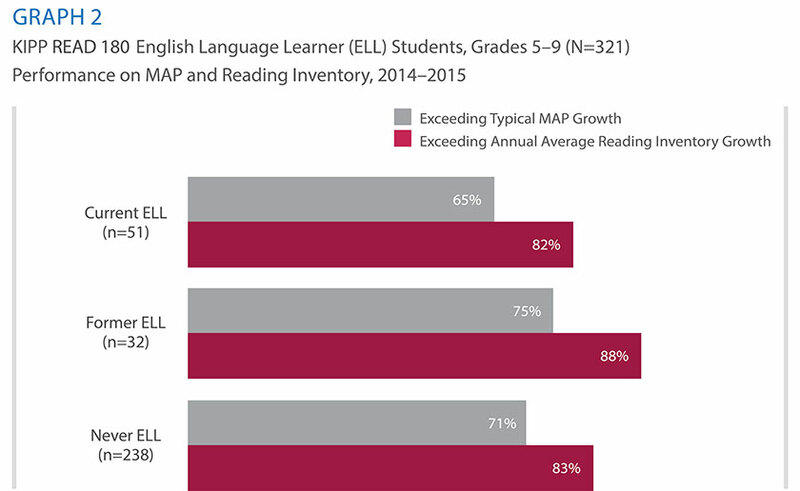 For English language learners, 65% exceeded typical MAP growth, and 82% exceeded annual average growth on The Reading Inventory. See Graph 2. 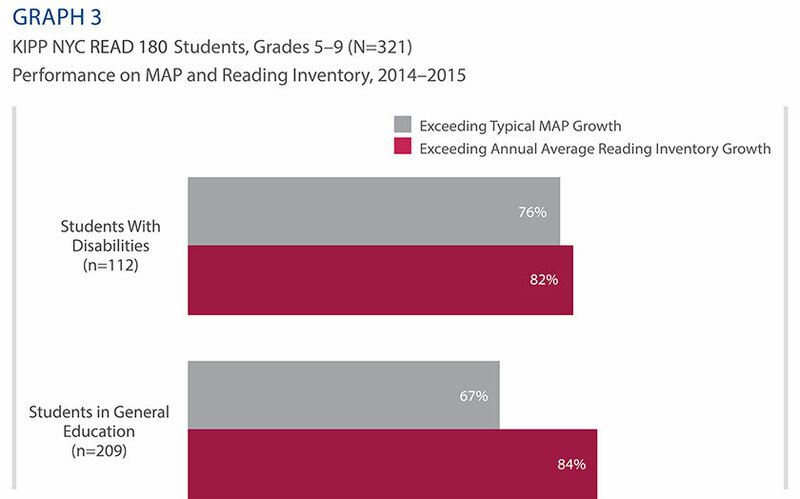 For students with an individualized education plan (IEP), 76% exceeded typical MAP growth, and 82% exceeded annual average growth on The Reading Inventory. See Graph 3. 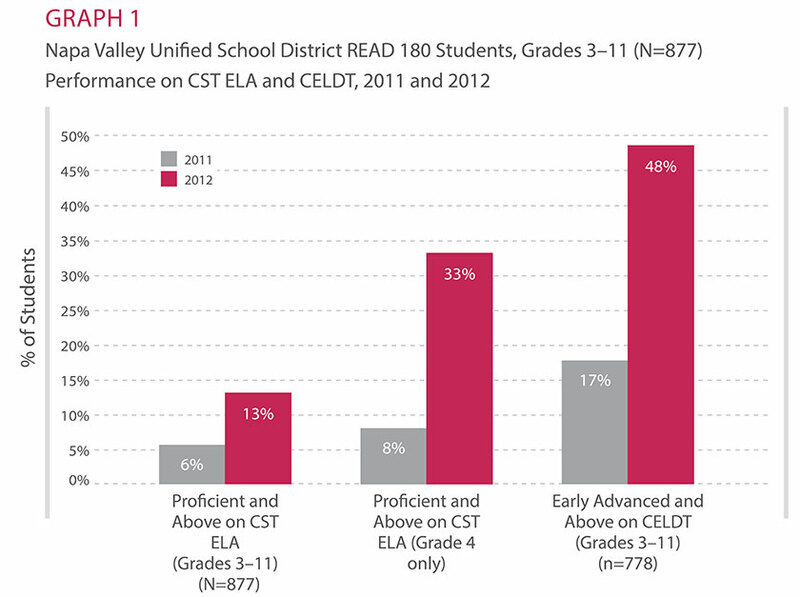 Limited-English proficient READ 180 students outperformed their nonparticipating peers on SAT-9. The Los Angeles Unified School District (LAUSD) is a large, urban school district with a diverse student body. 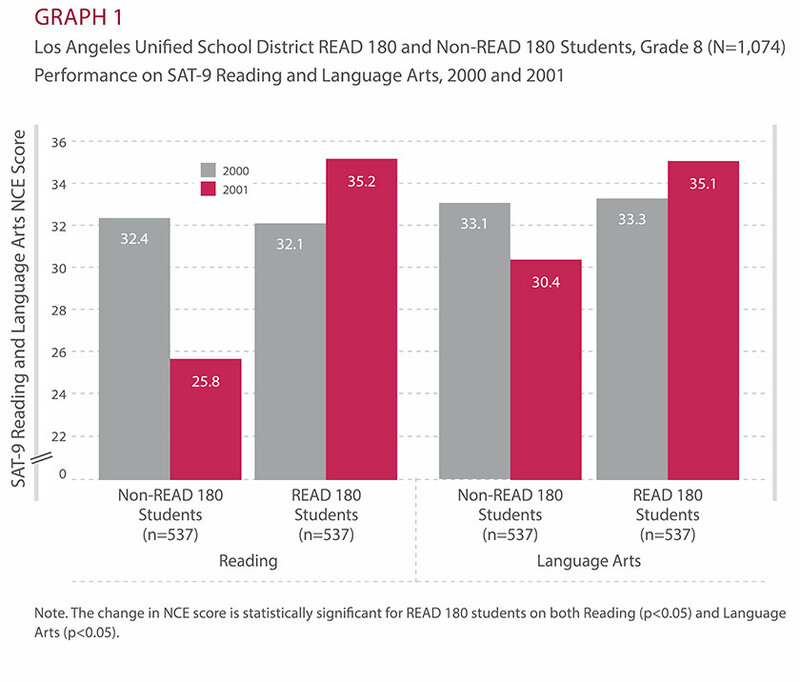 During the 2000–2001 academic year, LAUSD implemented READ 180 with eighth-grade students in their Intensive Academic Support (IAS) program. Students were enrolled in IAS based on several criteria, including poor performance on the Stanford Achievement Test Series, Ninth Edition (SAT-9); receiving a grade of D or F in eighth-grade English the prior year; and failing the district writing performance test. The large majority of READ 180 students in IAS were Hispanic (78%). More than two-thirds of the READ 180 students (69%) were classified as English learners: 42% were limited English proficient (LEP) and 27% of students were recently reclassified fluency English proficient (RFEP). In order to monitor READ 180 implementation, a trained observer visited 25 READ 180 classrooms in 21 middle schools. The one-hour visitations occurred May through June 2001. Almost all of the classes were 90-minute class periods where whole-group instruction was observed. All of the classes were 15–20 students in size. Core class activities were observed in 19 out of the 25 classrooms. In general, there was evidence in more than half of the classrooms observed that the READ 180 program was on model and operating well. In several classrooms, use of student data to improve instruction needed attention and monitoring by teachers. Papalewis (2004) collected and analyzed pretest and posttest SAT-9 Reading and Language Arts test data for 537 eighth-grade READ 180 students. A group of 536 students not participating in any special intervention, matched on pretest means, gender, ethnicity, and language proficiency, was chosen for comparison purposes. Data from the 2000 and 2001 SAT-9 Reading and Language Arts tests were used to measure student achievement for all 1,074 students. Independent t-tests revealed that the READ 180 participants demonstrated significant gains in reading achievement from 2000 to 2001. On average, students enrolled in READ 180 averaged a statistically significant gain of 3.1 NCEs in Reading and almost 2 NCEs in Language Arts on SAT-9. In contrast, the comparison group experienced a loss of 6.6 NCEs in Reading and 2.7 NCEs in Language Arts. Further, the average posttest NCE score was significantly higher for READ 180 students than for the comparison group on both the Reading and Language Arts tests (Graph 1). When disaggregated by English language classification, findings indicated that these trends continued for READ 180 English learners. 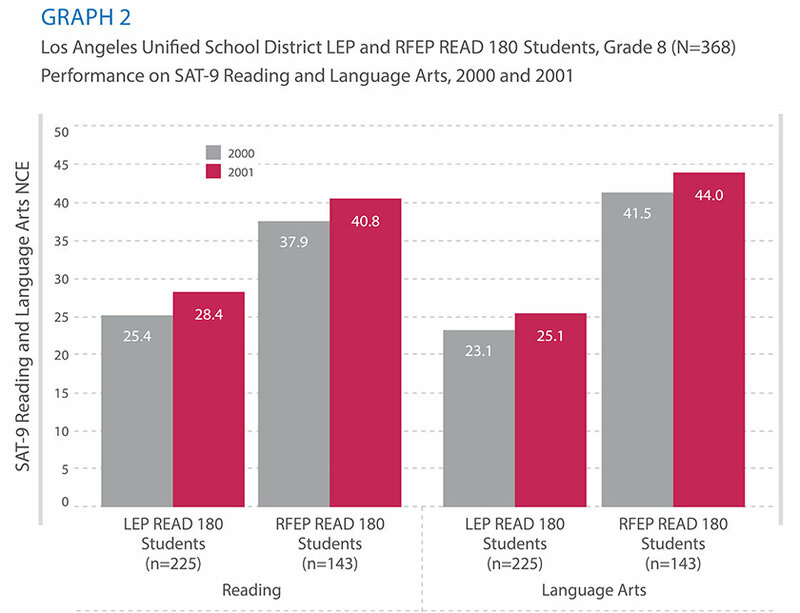 After one year in READ 180, students who were classified as LEP gained 3.0 NCEs in Reading and 2.0 NCEs in Language Arts, while students who were designated as RFEP gained 2.9 NCEs in Reading and 2.5 NCEs in Language Arts (Graph 2). Urban students demonstrate improved reading achievement after READ 180. Milwaukee Public Schools (MPS) consists of 175 schools enrolling approximately 80,000 students in Grades K through 12. In 2010, 63% of eighth-grade students were Proficient or Advanced on the state test, the Wisconsin Knowledge and Concepts Examination (WKCE), and 39% of tenth-grade students were Proficient or Advanced on the WKCE. During the 2010–2011 school year, American Institutes for Research (AIR) conducted a study of the Wisconsin Striving Readers Program* (Swanlund, Dahlke, Tucker, Kleidon, Kregor, Davidson-Gibbs, & Halberg, 2012). The program was originally planned to last two years, but because Congress eliminated the Striving Readers program midway through the grant, the study only followed students through one year of the intervention. Students were eligible to participate in the study if they received a score of Minimal or Basic on the WKCE. Students who did not have a WKCE score were also eligible based on having a score of Minimal or Basic on the district benchmark assessment, ThinkLink. If a student did not have a recorded score for either of these assessments, eligibility could be established based on teacher assessments and observations indicating that the student was performing at least two grade levels below expectations. The majority of students who participated in the program were African American (70%), followed by 19% Hispanic, 7% Caucasian, and 4% other. Thirty-six percent were students with disabilities, 8% were English language learners, and 88% received free or reduced-priced meals. *The Striving Readers Program was funded by the United States Department of Education with two aims: 1) to raise middle and high school students’ literacy levels in Title I-eligible schools with significant numbers of students reading below grade levels; and 2) to build a strong, scientific research base for identifying and replicating strategies that improve adolescent literacy skills. The full reports for each district are available at www2.ed.gov/programs/strivingreaders/. To assess program implementation, professional development ratings and classroom model ratings were determined based on professional development logs, teacher interviews, and principal interviews. To assess program impact, data from MAP were collected for 619 students (335 students in the READ 180 treatment group and 284 in the control group). As Graph 1 displays, in terms of fidelity of implementation of the professional development model, five of eight classrooms (62.5%) received a rating of medium (29–40), and three of eight classrooms (37.5%) received a rating of high (41–51). The average score across all classrooms was 39, which indicated that there was a medium level of fidelity. 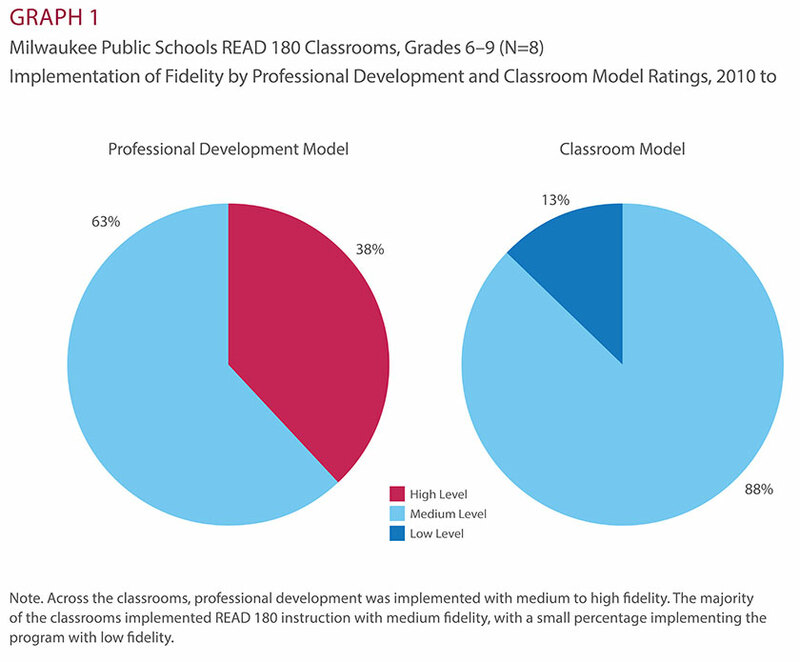 Overall, the READ 180 classroom model was implemented with high fidelity; however, due to low student attendance, seven of eight classrooms (87.5%) received a rating of medium, and one of eight classrooms (12.5%) received a rating of low. Teachers reported that prior experience teaching READ 180 and the support of the district READ 180 coordinator were important facilitators for successfully implementing the model. There was a statistically significant impact on the reading achievement of struggling readers in Grades 6–9 after one year of exposure to READ 180 instruction (effect size of .14). On MAP, students in the READ 180 treatment group scored approximately 1.8 points higher than students in the control group when controlling for pretest scores and student-level covariates. Struggling students, including those with disabilities, show gains in reading achievement after READ 180. The Newark Public Schools (NPS) system is the largest school district in New Jersey, serving a population of approximately 39,440 diverse students. Struggling middle school students in NPS participated in the Striving Readers program* for five project years, spanning from 2006 to 2011. 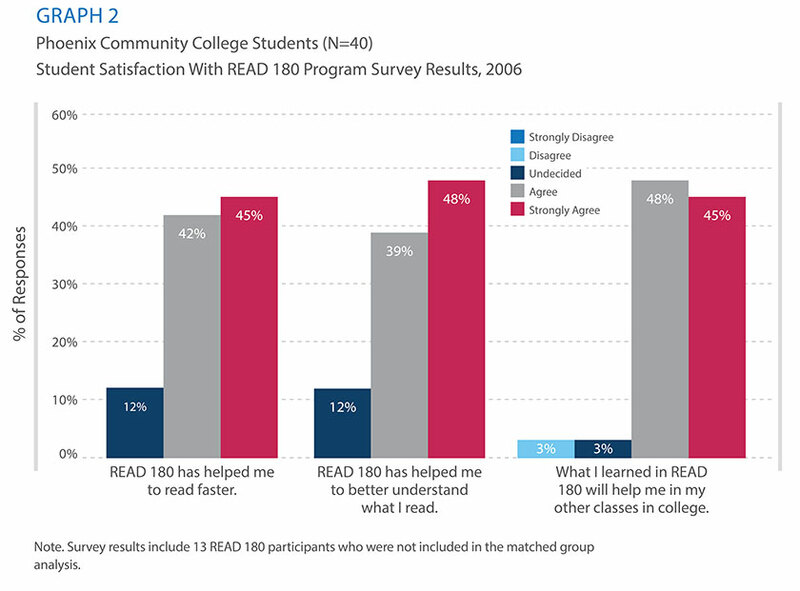 A third-party research organization, Westat Inc., evaluated the impact of the READ 180 intervention on the reading achievement of eligible participants over this period (Meisch et al., 2011). The original Striving Readers sample included all students in Grades 6–8 in participating schools who were reading two or more years below grade level. In year one, participants consisted of eligible students in Grades 6–8. In years two through four, additional students were added to the sample in the sixth grade only. In year five, no new students were added, and only the eighth-grade students were followed. To assess program impact, data from SAT-10 were collected for 5,098 students across the five years. *The Striving Readers program was funded by the United States Department of Education with two aims: 1) to raise middle and high school students’ literacy levels in Title I-eligible schools with significant numbers of students reading below grade levels; and 2) to build a strong, scientific research base for identifying and replicating strategies that improve adolescent literacy skills. The full reports are available at www2.ed.gov/programs/strivingreaders/. 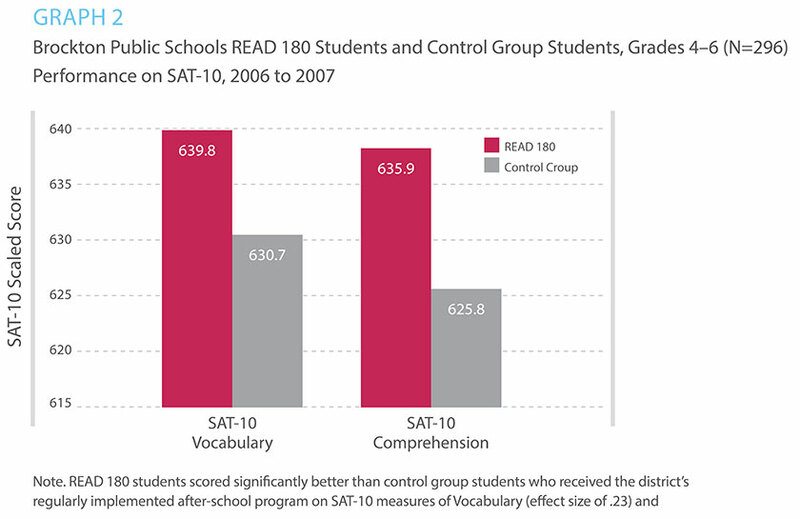 Overall, students who received two years of READ 180 instruction performed significantly better on the Reading Comprehension subtest of the SAT-10 than control group students (effect size of .14). 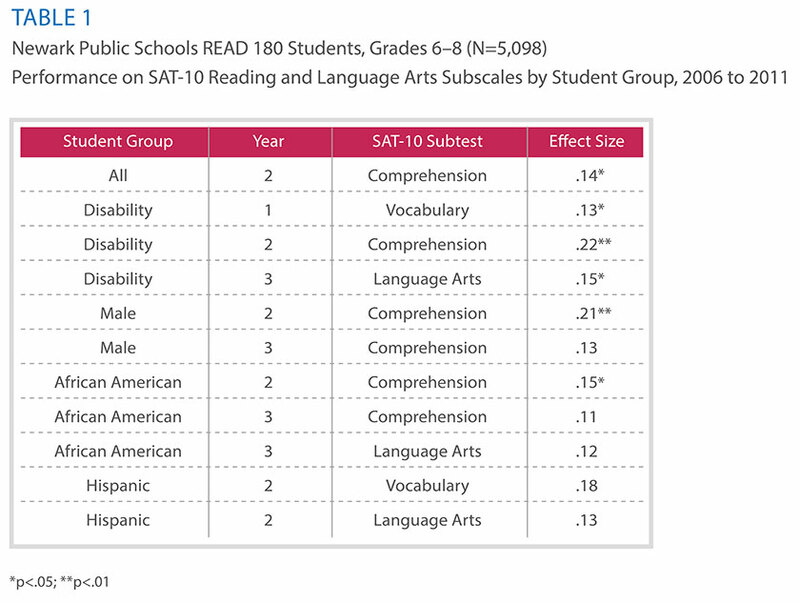 This finding held for students with disabilities and African American students, with READ 180 being particularly effective for students with disabilities (Table 1). Students with disabilities performed significantly better on the Vocabulary subtest of SAT-10 after receiving one year of READ 180 instruction (effect size of .13), as well as on the Reading Comprehension subtest after receiving two years of READ 180 instruction (effect size of .22). Male students and African American students who received READ 180 instruction for two years also performed significantly better on the Reading Comprehension subtest (effect size of .21 and .15, respectively). Graph 1 displays those results that were statistically significant. Generally, students who received one year or three years of READ 180 instruction had higher mean scores on SAT-10 subtests than control group students; however, these differences did not reach statistical significance. Teachers report benefits of READ 180 for autistic students. Located in Rochester, NY, East High School enrolls approximately 1,770 students in Grades 7–12. East High School runs a middle school autism program that consists of two self-contained classrooms of seventh- and eighth-grade autistic students. The school began using READ 180 in 2006 and the program was first implemented for autistic students in 2009–2010, when the autism program was in its beginning stages. By the 2010–2011 school year, there were two classrooms of autistic students—seventh and eighth grade—with eight students in each class. Of these students, 14 (88%) were male, 13 (81%) received free and reduced-price lunches, and 3 (19%) were English language learners (ELL). Half (50%) of the students were African American; the remaining students were Latino (13%), Caucasian (13%), and Asian (6%). 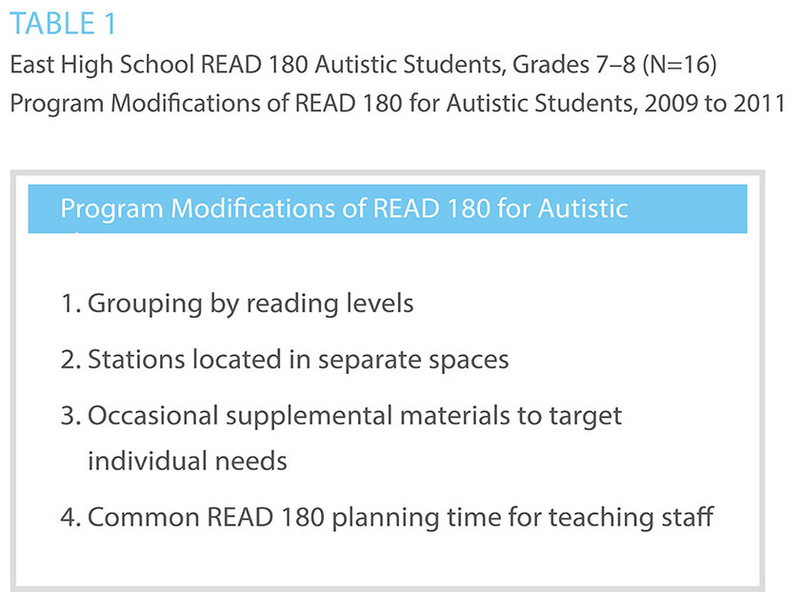 The program for autistic students at East High School retained the basic READ 180 model; however, some minor modifications were made and increased support was provided for certain components (Table 1). Implemented four days a week, each day began and ended with whole-group, teacher-directed instruction, as prescribed, and was delivered to each grade level separately. During the small-group rotations, the two grade levels were combined, and students moved between the two classrooms as they rotated through stations of small-group instruction, independent reading, and individual practice on the software. In 2010–2011, a group interview was conducted with the seventh- and eighth-grade classroom teachers, the literacy coach, and the principal to ascertain their impressions of the effectiveness of READ 180 for the 16 students in the autism program. Brief interviews were also conducted with two students. 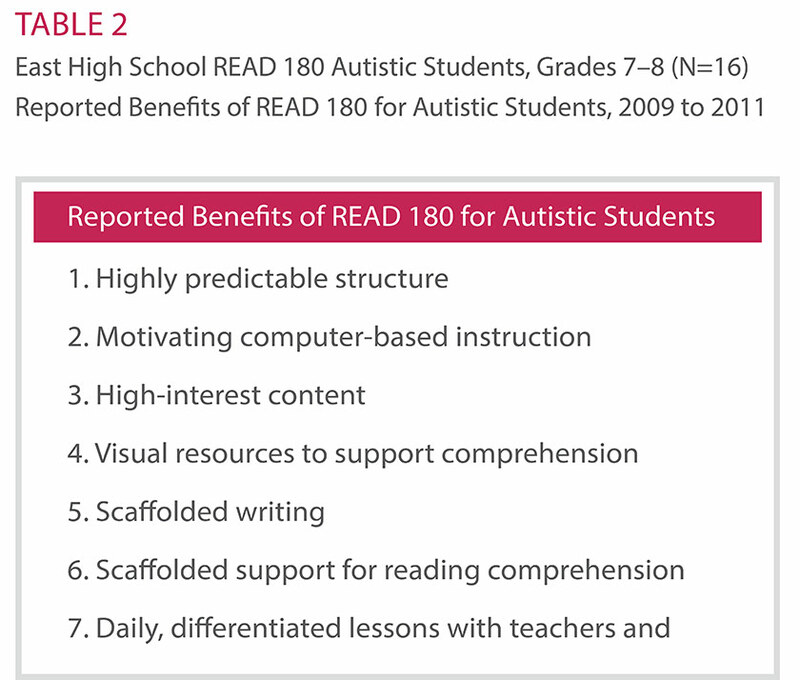 The interviewees identified a number of specific aspects of READ 180 that they found were particularly beneficial for autistic students and their teachers (Table 2): 1) highly predictable structure; 2) motivating computer-based instruction; 3) high-interest content; 4) visual resources to support comprehension; 5) scaffolded writing; 6) scaffolded support for reading comprehension; and 7) daily, differentiated lessons with teachers and peers. In addition, the teachers reported that the following adjustments and supports helped to make the program successful for autistic students: 1) grouping by reading levels; 2) stations located in separate spaces; 3) occasional supplemental materials to target individual needs; 4) common READ 180 planning time for teaching staff; and 5) ongoing professional development and coaching. See Table 1. SRI results of the 16 autistic students revealed a wide range of reading proficiency and progress across the two classrooms, which is typical among autistic students who experience a variety of cognitive and behavioral challenges. 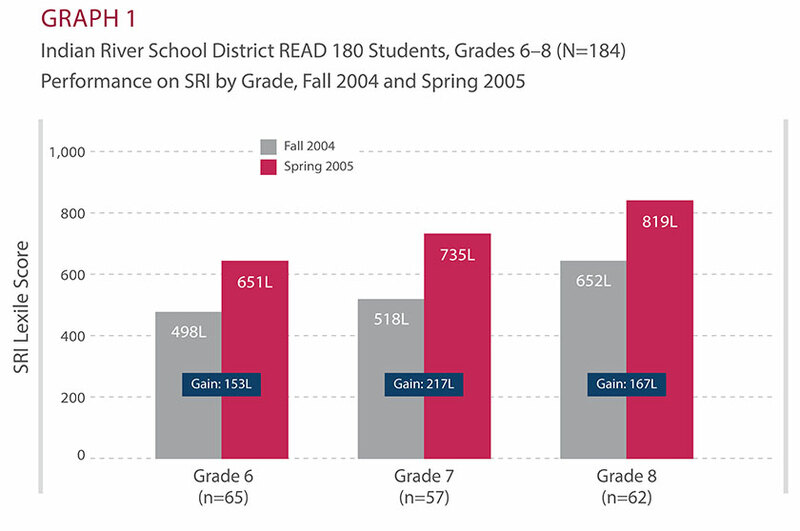 In the 2010–2011 school year, seventh-grade fall Lexile measures ranged from Beginning Reader (BR) to 796L, while spring Lexile measures ranged from BR to 820L. In the eighth grade, fall Lexile measures ranged from BR to 986L, and spring Lexile measures ranged from BR to 1242L. The performance of the eight eighth-grade autistic students on SRI was explored to demonstrate student gains made while using READ 180 for two years. Four students, who entered the program with some reading proficiency (Lexile measures ranging from 400L to 1000L), made more than one grade level of growth (a range of gains from approximately 200L to 500L) after receiving READ 180 instruction. Three other students, who entered the program with limited reading proficiency, made a range of gains from approximately 50L to 200L after receiving the instruction. More time spent on the READ 180 software is associated with greater improvement on SRI. 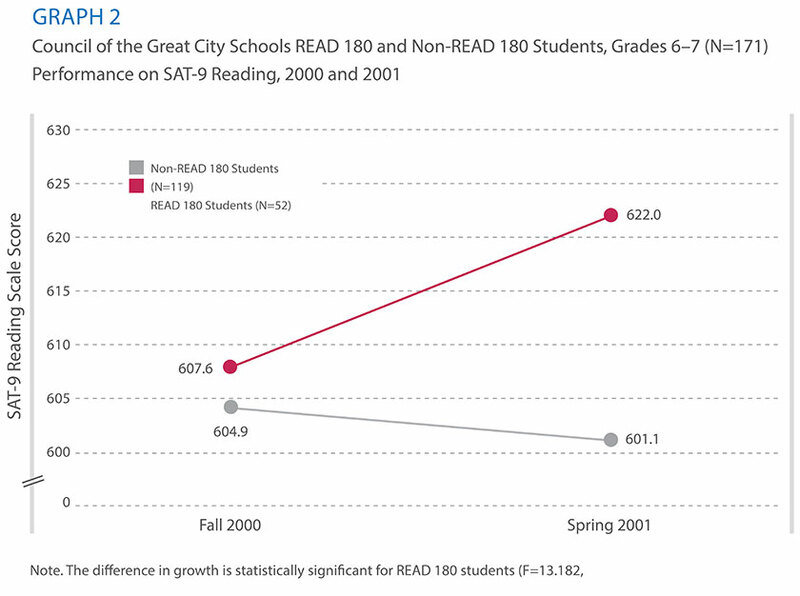 During the 2003–2004 school year, Saint Paul Public Schools implemented READ 180 in 11 middle schools to accelerate struggling readers’ academic performance. A total of 820 students participating in the READ 180 program during the 2003–2004 school year. Four hundred thirteen were seventh graders and 407 were eighth graders. Of these, 29% were African American, 31% were Asian American, 24% were Caucasian, 14% were Hispanic, and 2% were Native American. Approximately 45% of students were classified as general education students, 34% were classified as English language learners (ELL), and 15% were students with disabilities. Data analysis was limited to a sample of 573 seventh and eigth grade students who had both pre- and post-test SRI scores. Admon (2005), an independent researcher, collected pretest and posttest SRI scores from 573 seventh- and eighth-grade students (2005). Following one year of READ 180 instruction, data indicate that READ 180 students exceeded fall-to-spring Lexile (L) growth on SRI (p<0.01). Typically, middle school students performing at the 25th percentile are expected to gain 75L. 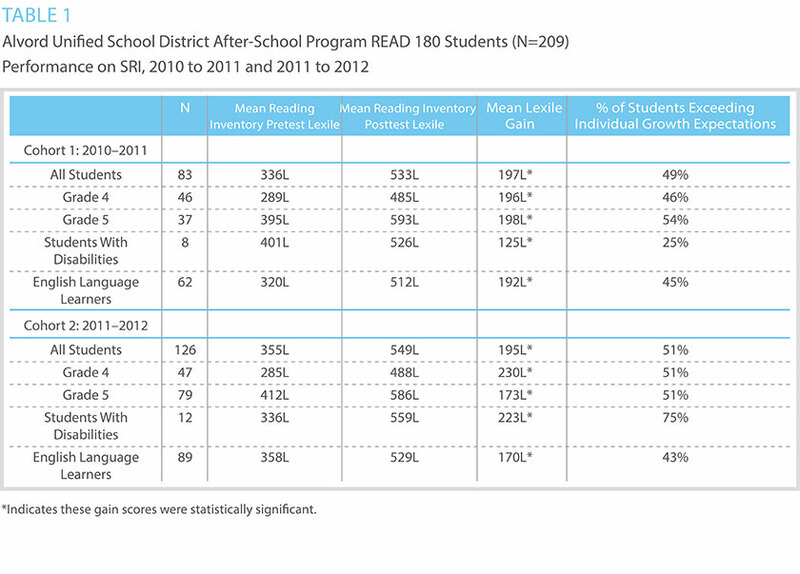 Findings indicate that READ 180 students achieved an average gain of 110L, 35L higher than expected annual growth. 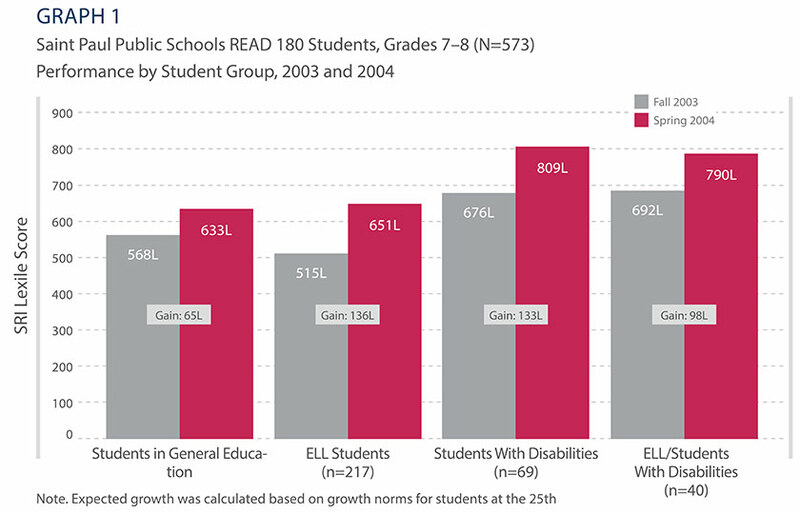 In addition, as Graph 1 shows, the SRI Lexile gains exhibited by students classified as ELL or as having a disability also exceeded annual growth expectations (136L and 133L, respectively). An analysis of variance (ANOVA) revealed that mean pretest to posttest gains between these subgroups were not significantly different (p=0.13). This suggests that READ 180 can be used effectively with diverse readers. The percentage of students falling into each of the SRI Performance Levels—Below Basic, Basic, Proficient, and Advanced—was examined in 2003 and 2004. In 2003, prior to READ 180, 86% of targeted students fell in the Below Basic or Basic Performance Levels. However, by spring 2004, only 72% did, a reduction of 14%. Conversely, the percentage of students falling into the Proficient and Advanced categories doubled, from 14% to 28%. Further, 61% of students who performed at the Below Basic Performance Level in 2003 moved to the Basic Performance Level or higher (Graph 2). Data on level of READ 180 implementation was also provided for each classroom. Graph 3 depicts the amount of student growth in SRI stanines in classrooms with varying amounts of time devoted to READ 180. T-test and regression analysis show that students spending a greater number of hours on the READ 180 software were more likely to exhibit improvement on SRI. For example, schools with daily READ 180 classes over 70 minutes performed significantly better than schools with classes under 70 minutes. 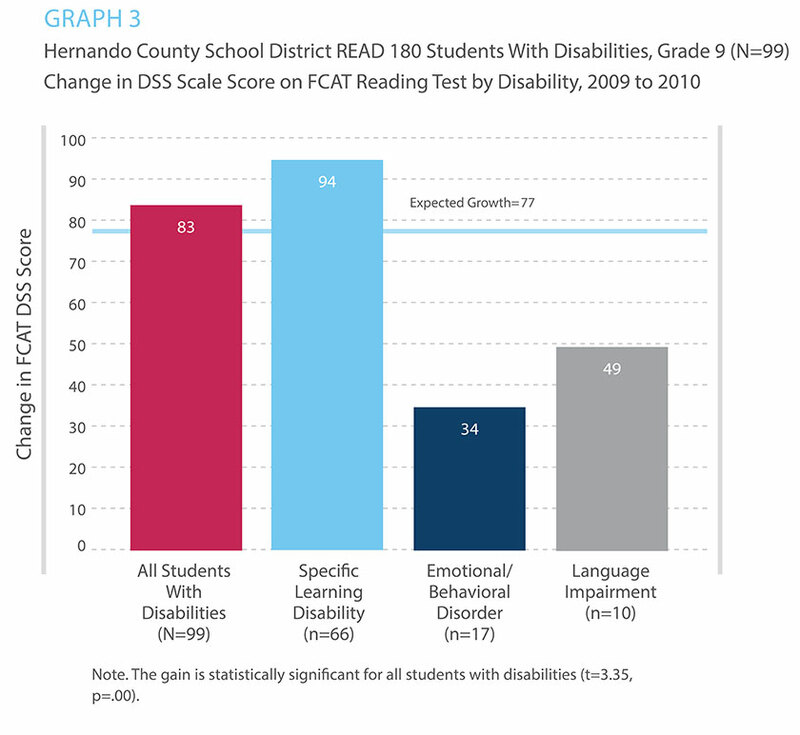 READ 180 students in general education and students with disabilities exceeded expected yearly growth benchmarks on FCAT Reading. During the 2009–2010 school year, the School District of Osceola County (SDOC) implemented READ 180 with middle and high school students who tested in Level 1 or Level 2 on the prior year’s Florida Comprehensive Assessment Test (FCAT) Reading Test. Approximately 59% of these students were Hispanic, 19% were Caucasian, 12% were African American, 7% were multiracial, and 2% represented other ethnicities. Nearly 75% were economically disadvantaged and received free or reduced-price lunch through the National School Lunch Program, 16% of students were English language learners (ELL), and 19% were students with disabilities. FCAT Reading Test data were examined for 1,333 sixth- through tenth-grade students who had spring 2009 and spring 2010 scores. Dependent t-tests revealed that each grade level made significant Developmental Scale Score (DSS) gains on the FCAT Reading Test from 2009 to 2010 (Table 1). Students in the seventh and eighth grades made the largest improvements, demonstrating gains of 208 and 166 DSS points, respectively. Data also indicated that READ 180 students exhibited much greater DSS growth from 2009 to 2010 than did their peers in the state and district (Graph 1). For example, the seventh-grade READ 180 DSS change was 94 points higher than that observed statewide and 71 points higher than that observed district-wide. It is important to note that tenth-grade students across the state performed well below the 77-point DSS growth benchmark. In general, the tenth-grade FCAT Reading Test is more rigorous than for the other grade levels. Notably, tenth-grade READ 180 students outperformed their district and state peers. Findings revealed that, overall, more than half (55%) of all READ 180 students surpassed the DSS growth benchmark on the FCAT Reading Test. When the data were parsed by education classification, the percentage of students with disabilities who performed above the expected DSS growth benchmark was comparable (48%) to that of all READ 180 students with disabilities (55%). Further disaggregation of the data by disability type revealed that approximately 77% of these students have a specific learning disability, including dyslexia. As Graph 2 shows, students with a specific learning disability demonstrated higher rates of surpassing the growth benchmark (51%) than did students with a language impairment (25%) or an emotional and/or behavioral disorder (33%). Native American READ 180 high school students demonstrated statistically significant improvements on SRI. Located within the Northeastern section of the Navajo Indian Reservation in New Mexico, the Central Consolidated School District (CCSD) piloted READ 180 during the fall of 2002 at Shiprock High School to increase student reading achievement among ninth- and tenth-grade students. One hundred percent of Shiprock’s 815 students are Native American and face unusual challenges. For example, 80% of students ride the bus for more than 100 miles to and from school each day. During the 2002–2003 school year, 39 students (18 ninth graders and 21 tenth graders) participated in READ 180. Forty students (24 ninth graders, 14 tenth graders, one eleventh grader, and one twelfth grader) participated during the following 2003–2004 school year. 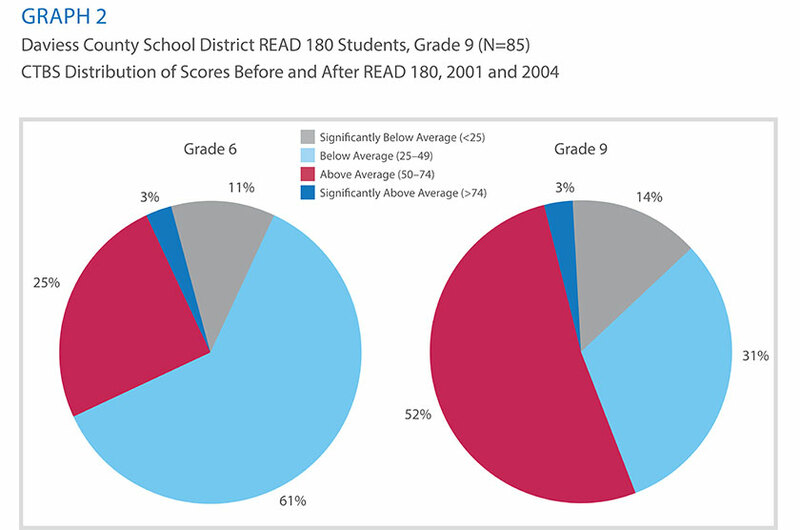 In addition, longitudinal data for 2002–2003 READ 180 students who did not participate in READ 180 during the 2003–2004 school year are included in this analysis, as well as the data from a subset of six students who participated in READ 180 through both of these years, from fall 2002 to spring 2004. In order to measure the impact of READ 180, Shiprock collected and examined data from the SRI for two consecutive school years. Overall, Shiprock students enrolled in READ 180 evidenced statistically significant reading gains on SRI. 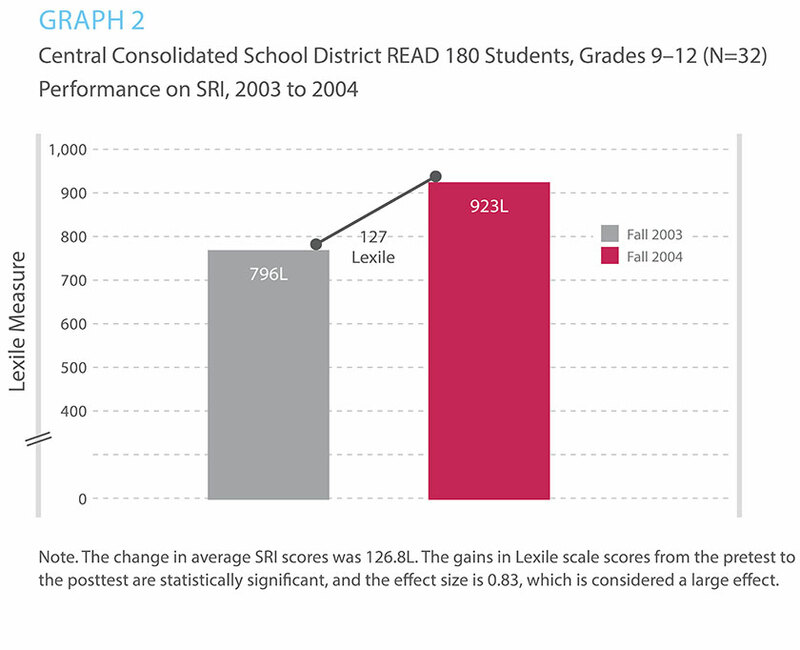 From 2002–2003, 82% of READ 180 participants improved their SRI Lexile (L) measures. On average, ninth- and tenth-grade students who participated in READ 180 gained 199L, from 688L at pretest to 887L at posttest. 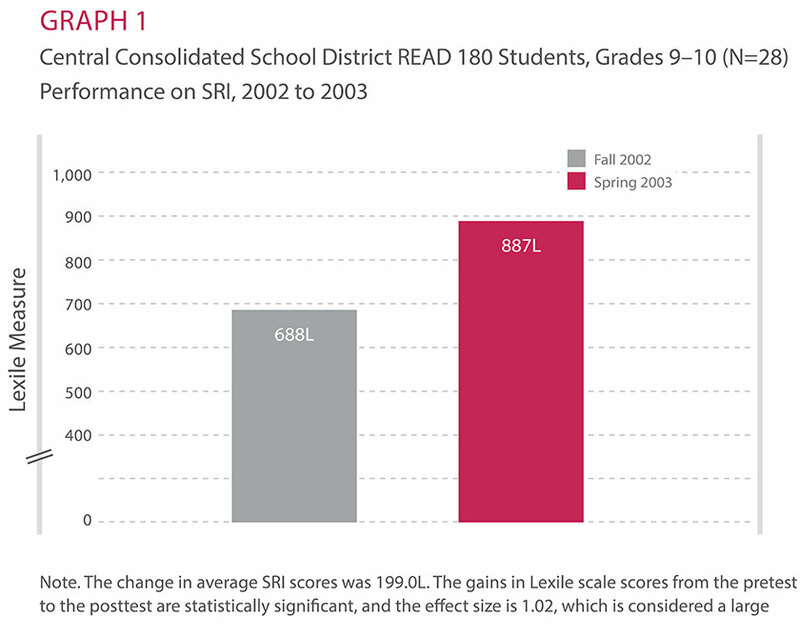 The statistically significant Lexile gain demonstrated by READ 180 students is more than quadruple the expected fall-to-spring growth for high school students (50L) (Table 1 and Graph 1). During the 2003–2004 school year, ninth- through twelfth-grade students who participated in READ 180 gained an average of 127L, from 796L at pretest to 923L at posttest. Similar to the previous year, the Lexile gain demonstrated by the READ 180 students exceeds the expected gain as determined by the normative sample (Graph 2). Dropout rates decreased at two READ 180 high schools by 35% and 55%. Located in Las Vegas, Nevada, Clark County School District (CCSD) first implemented READ 180 at eight middle schools and two high schools during the 1999–2000 school year. In order to measure the effectiveness of READ 180 with middle school students, CCSD collected pretest and posttest data from the SRI during the 2002–2003 school year. For this analysis, the data from 14 middle schools were analyzed by Dr. Rosemary Papalewis (2003). In a separate analysis and in order to examine the impact of READ 180 on high school students, CCSD collected SRI data from the 2004–2005 school year from 1,945 ninth graders; these data were analyzed by Keith Zvoch and Larry Letourneau (2006). In addition to these analyses, high school dropout rates were later reported by Emily Richmond (2006) in the local paper. Middle School Results (Papalewis, 2003) SRI Normal Curve Equivalent (NCE) and Percentile Rank (PR) scores were obtained for 423 READ 180 students who completed pretests during August–October 2002 and posttests during March–May 2003. During 2002 to 2003, CCSD was shifting their student tests from the Terra Nova test (fall 2001) to the Iowa Test of Basic Skills (fall 2002); therefore, comparison scores were not available for the purposes of this study. From pretest to posttest, READ 180 students demonstrated an average gain of 119 Lexile (L) measures and a PR gain of five points on SRI (Table 1). These gains correspond to an average NCE gain of 7.3. An analysis of SRI scores revealed that these improvements were statistically significant (p<0.01). Papalewis’s analysis also examined the percentage of students at pretest and posttest in each of the four SRI Performance Levels: Below Basic, Basic, Proficient, and Advanced. After participation in READ 180, 34% of sixth graders, 50% of seventh graders, and 62% of eighth graders improved their Performance Level (Graph 1). 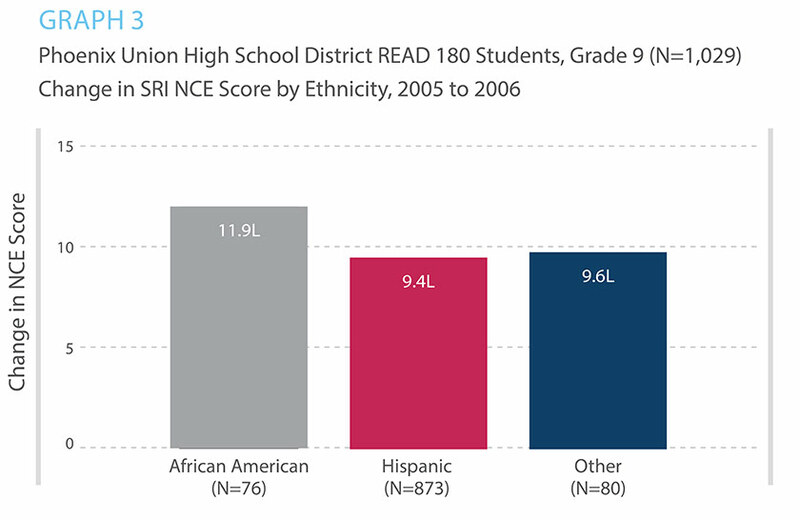 High School Results (Zvoch & Letourneau, 2006) During the 2004–2005 school year, SRI scores were collected and analyzed for ninth-grade READ 180 students. Findings from a growth analysis revealed that students with disabilities and English language learner (ELL) students grew at a faster rate than their general education and English proficient peers, respectively. 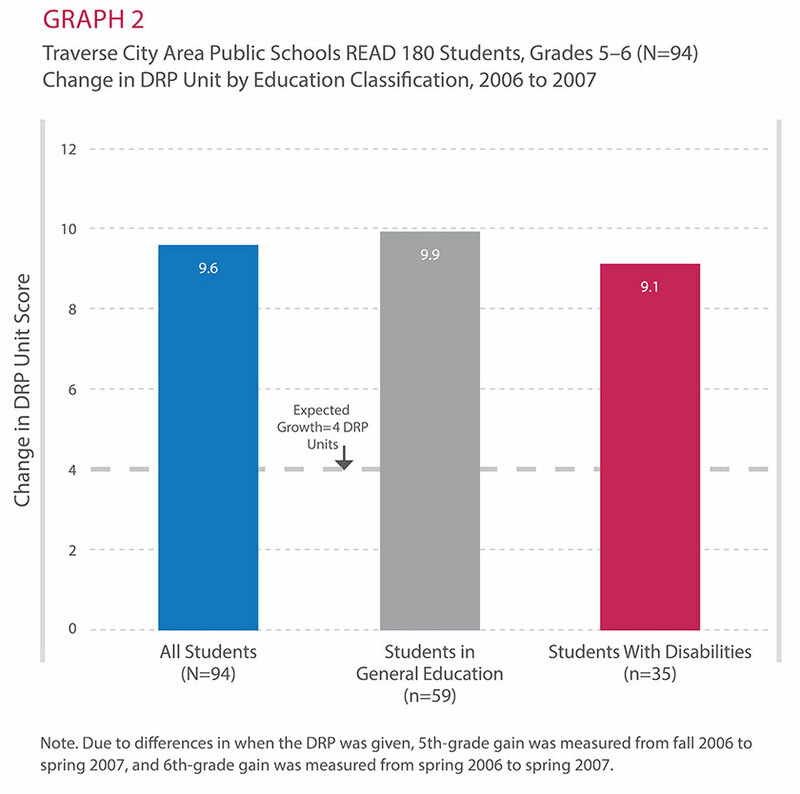 In fall 2004, students with disabilities were at a significantly lower reading level than general education students. After one year of READ 180, students gained, on average, just over half (0.54) of a scale score point per day as compared to the general education average gain of approximately one quarter of a scale score point per day. As a result, the gap in performance between students with disabilities and general education students was reduced from 150 to 80 scale score points (or, from 0.60 to 0.32 of a standard deviation). Similarly, ELL students grew faster than their English-proficient peers during ninth grade. ELL students gained an average of half (0.50) a scale score point per day, whereas English proficient students gained just over one quarter of a scale score point per day. The achievement gap between ELL and English proficient students was thereby reduced from 200 to 140 scale score points (or, from 0.80 to 0.56 of a standard deviation). High School Results (Richmond, 2006) Following the results presented above, high school dropout rates were reported in the local paper. According to Richmond, two high schools in CCSD attributed decreases in their dropout rates, in part, to the introduction of reading intervention with READ 180. At Cimarron-Memorial High School, which began its READ 180 program with 215 students during fall 2004, and at Centennial High School, which began its program with 106 students in fall 2005, the dropout rate decreased by 35% and by 55%, respectively, during the first year of READ 180 implementation. 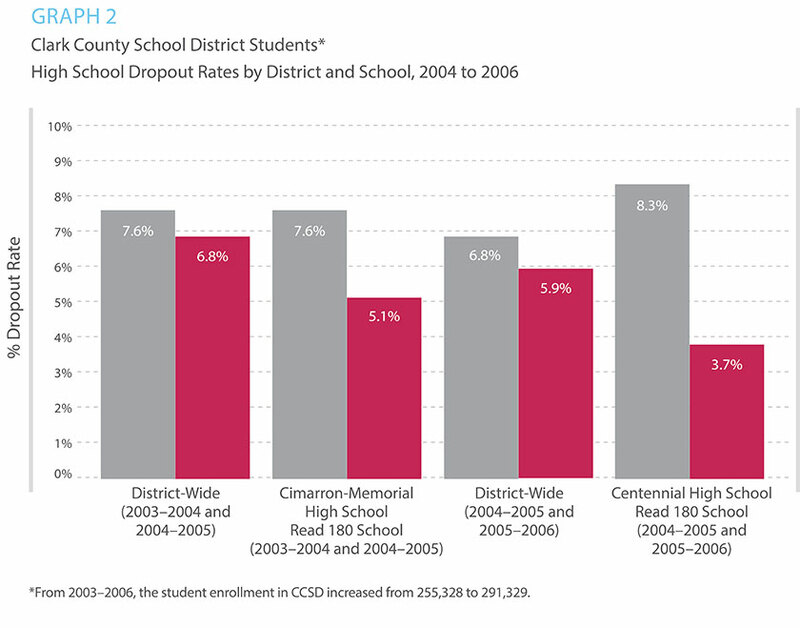 Overall dropout rates in CCSD decreased by 11% during 2004–2005 and 13% during 2005–2006 (Graph 2). Double the percentage of ninth-grade students scored “above average” on the CTBS after one year of READ 180. Located in northwestern Kentucky, Daviess County School District (DCSD) serves students in kindergarten through twelfth grade. During the 2003–2004 school year, DCSD implemented READ 180 in one middle school and two high schools. At Daviess Middle School (MS), sixth graders who scored below the 50th percentile on the Northwest Evaluation Association Measures of Academic Progress (NWEA MAP) reading test were selected to participate in the READ 180 reading intervention program. Participating middle school students were classified as students with disabilities, general education students, or alternative education students. At Apollo High School (HS) and Daviess HS, ninth graders who scored below the 50th percentile on Explorer tests were also selected to participate. All high school READ 180 participants were designated as general education students. Results from the NWEA MAP for 37 middle school students and the Comprehensive Test of Basic Skills (CTBS) for 85 high school students were collected and analyzed by the DCPS Assessment, Research, and Curriculum Department (2005). This analysis discusses the results for students at Daviess MS and Daviess HS only. Findings reveal that middle school students achieved a statistically significant gain of 5.7 RIT (Rausch Units) on the NWEA MAP test. Typically, middle school students are expected to gain 3.2 RIT units. The actual RIT gain demonstrated by READ 180 students exceeded the typical RIT fall-to-spring gain by 2.2 points (as determined by the 2008 normative sample). This translates into nearly two years’ reading growth (Graph 1). Overall, 40% more students at Daviess MS were reading on grade level following one year of READ 180. The CTBS is a norm-referenced test that assesses and compares individual student achievement to other students nationwide in the same grade. Ninety-five students with valid pretest and posttest CTBS scores were included in the data analysis. The CTBS is administered in the sixth and ninth grades. At Daviess HS, 72% of the study sample had scored below average range on the CTBS when they were in sixth grade. After READ 180 intervention, only 45% of these students were reading below average. Meanwhile, the number of students reading above average doubled, from 25% to 52% (Graph 2). The average gain on the CTBS test from sixth to ninth grade for this cohort of READ 180 students was 6.0 National Percentile (NP) points. Ninth- and tenth-grade English 1 and 2 Intensive students are on track for college as demonstrated by state test. Serving approximately 4,270 students in Grades 9–12, James A. Garfield Senior High School (Garfield High) is one of more than 60 high schools in the Los Angeles Unified School District (LAUSD). As the second-largest public school district in the country, LAUSD serves approximately 695,000 diverse students in Grades Pre-K–12, at 696 schools. The large majority of students at Garfield High are Hispanic (99%). Approximately 87% of the students receive free and reduced-price lunch, and 30% of students are classified as English language learners (ELL). Garfield High had been using READ 180 as an integral component of its English 1 Intensive course for ninth-grade students since 2008. During the 2010–2011 academic year, the school continued using READ 180 with its English 1 Intensive course for ninth graders and expanded to offer an English 2 Intensive course for tenth graders. The English 1 and English 2 Intensive courses are yearlong courses built on the daily 90-minute READ 180 Instructional model, which consists of time spent on the Instructional software, small-group instruction, and modeled and independent reading. Students who performed at the Basic or below performance levels on the prior year’s California Standards Test of English Language Arts (CST ELA) were enrolled into one of the English 1 or 2 Intensive courses. 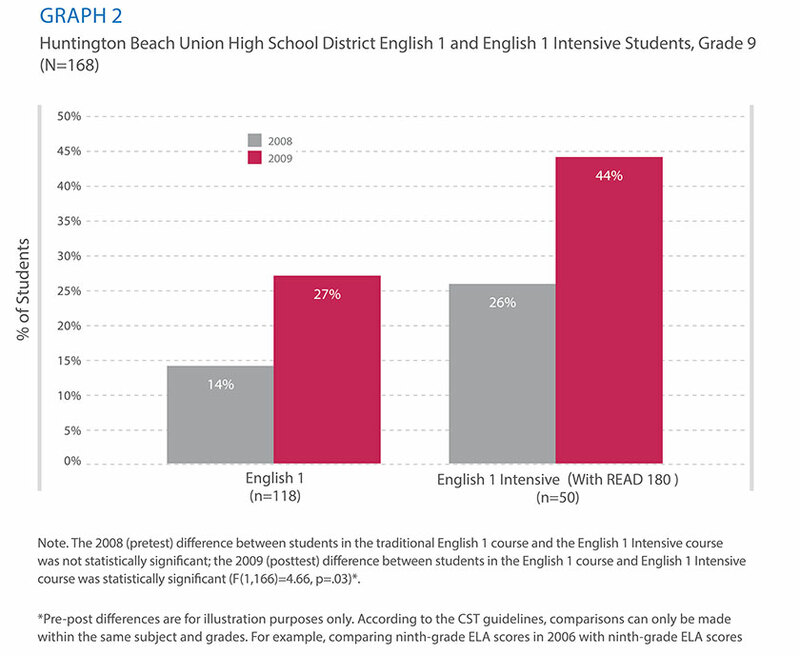 Students who were enrolled into an English 2 Intensive course had also placed into READ 180 during the 2009–2010 school year after having performed in the lower quartile of the CST ELA Far Below Basic Performance Level during the spring of 2009. Data from the CST ELA was obtained from 232 ninth-grade and 183 tenth-grade students who used the program during the 2010–2011 school year. Analyses of the reading performance for ninth-grade students enrolled in English 1 Intensive revealed remarkable improvements. After one year of English 1 Intensive, built on the READ 180 model, nearly 30% of these students performed at the Proficient level or above. As Graph 1 shows, from spring 2010 to spring 2011, the percentage of students who performed at Basic or below decreased from 99% (63% at Basic + 33% at Below Basic + 3% at Far Below Basic) in spring 2010 to 70% (54% + 14% + 2%) in spring 2011. In tandem, the percentage of students who performed at Proficient or above on the CST ELA increased from 1% to 29%. Likewise, tenth-grade students enrolled in English 2 Intensive also revealed improvements. As Graph 2 shows, from spring 2010 to spring 2011, the percentage of students who performed at Basic or below decreased from 89% (65% + 16% + 8%) to 86% (60% + 25% + 1%). Concurrently, the percentage of students who performed at Proficient or above on the CST ELA increased from 10% to 13%. * READ 180 implementation in HCSD varied from 47 to 97 minutes per day and from three to five days per week, with an alternating, full rotational schedule occurring every other day at some sites. Ninth-grade READ 180 students with specific learning disabilities exceeded expected yearly growth benchmarks on the FCAT Reading. Hernando County School District (HCSD) is located on the central-west coast of Florida, north of Tampa Bay. Of the 22,820 students the district enrolls, approximately 74% are Caucasian, 13% are Hispanic, 7% are African American, 5% are Native American/multiracial, and 1% are Asian. Approximately 16% of students are classified as having disabilities. During the 2009 to 2010 school year, ninth-grade students who scored in Level 1 or Level 2 on the spring 2009 Florida Comprehensive Assessment Test (FCAT) Reading Test were placed into READ 180. Spring 2009 and spring 2010 FCAT Reading Developmental Scale Score (DSS) data were analyzed for 436 ninth-grade READ 180 students. As Graph 1 shows, these students achieved an average FCAT Reading DSS score of 1679 at pretest and 1768 at posttest, resulting in a statistically significant gain of 89 points. These improvements in performance were maintained when the data were disaggregated, revealing that students with disabilities also demonstrated statistically significant gains (Graph 2). Approximately two-thirds of students with disabilities include those diagnosed with a specific learning disability, including dyslexia. 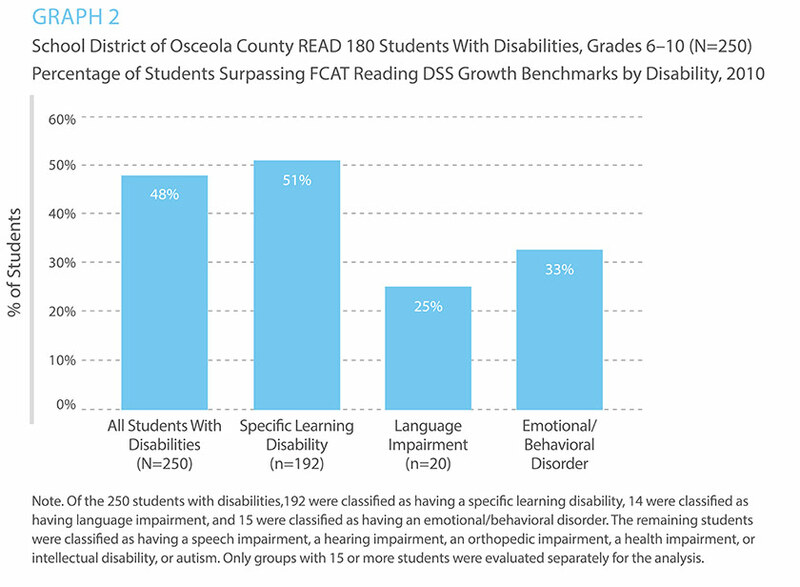 As Graph 3 illustrates, students with a specific learning disability showed the greatest average DSS gain and exceeded expected yearly growth benchmarks on the FCAT Reading Test in 2010. Students using READ 180 in English 1 Intensive course outperformed students in traditional English 1 course on CST ELA. Situated in western Orange County, the Huntington Beach Union High School District (HBUHSD) enrolls more than 16,000 students. Approximately 45% of students were Caucasian, 22% were Asian American, 22% were Hispanic/Latino, 7% Native American, 1% Filipino, 1% African American, 1% Pacific Islander, and less than 1% multiracial. Twenty-one percent of HBUHSD students qualifed for free and reduced-price lunch through the National School Lunch Program, and 10% of students were English language learners (ELL). HBUHSD was seeking to implement an adolescent literacy program for at-risk ninth-grade students, with the goal of strengthening students’ literacy skills and setting them on track for college. Toward this end, the district offered three high schools the opportunity to pilot a new English 1 Intensive class that carefully integrated English 1 and READ 180 into a comprehensive and cohesive course of study that would meet the A–G requirements for University of California-approved course work. During the 2008–2009 school year, the English 1 Intensive course was implemented with ninth-grade students in three classes in three different schools. The English 1 Intensive course combined the READ 180 90-minute instructional model with additional core literature designed to support the California Standards for ninth-grade English. Students who were selected to participate in the program scored a grade equivalent of 7.5 on the Vocabulary and Reading Comprehension Subtests of the Gates-MacGinitie Reading Test (GMRT) in their eighth-grade year (in February 2008). 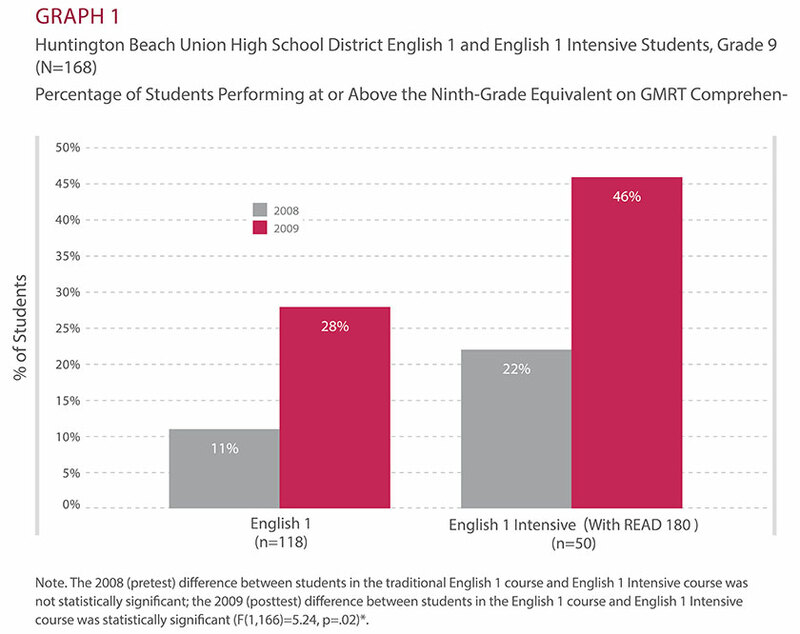 In an effort to measure achievement gains in the English 1 Intensive course, 2008 and 2009 data from the GMRT and California Standards Test of English Language Arts (CST ELA) were gathered from 50 students enrolled in the English 1 Intensive course and a comparison group of 118 students solely enrolled in the traditional English 1 course (Scholastic Research, 2009). Students in the English 1 Intensive course also demonstrated positive outcomes on the CST ELA. ANOVA results indicated that a significantly greater proportion of students in the English 1 Intensive classes (44%) scored Proficient or Advanced on the 2009 CST ELA. Forty-four percent of the English 1 Intensive students scored Proficient or Advanced in 2009, compared with 27% of students in the traditional English 1 classes (Graph 2). Successful findings replicated for three years in a row, including sustained results one year after intervention for English language learners. The Phoenix Union High School District (PUHSD) began implementing READ 180 in the fall of 2003 to help struggling ninth-grade students become proficient readers. Students were identified to participate in READ 180 if they scored below an 8.0 grade equivalent on the Stanford Achievement Test Series, Ninth Edition (SAT-9) during the spring of their eighth-grade year. An independent research firm, Policy Studies Associates (PSA), evaluated the immediate impact on three cohorts of ninth-grade READ 180 students (White & Haslam, 2005). The study included ninth-grade students who participated in READ 180 during the 2003–2004 school year (Cohort 1), the 2004–2005 school year (Cohort 2), or the 2005–2006 school year (Cohort 3). Cohorts 1, 2, and 3 were each compared to matched groups of nonparticipants that were selected through propensity matching. In addition to the evaluation of the end-of-ninth-grade findings, PSA also evaluated the longitudinal impact (during the spring of tenth grade) for the first two cohorts of students, approximately one year after program participation. Study results showed that READ 180 participants outperformed matched nonparticipants on standardized reading tests at the end of ninth grade. Cohort 1 participants achieved significantly higher average scores on the SAT-9 (31.4 NCEs) than matched nonparticipants (30.1 NCEs) in spring 2004. Likewise, Cohort 2 READ 180 participants averaged significantly higher scores on the Terra Nova (41 NCEs) than did matched nonparticipants (38 NCEs) in spring 2005. Continuing this positive trend, Cohort 3 READ 180 participants achieved significantly higher average scores on the Terra Nova than did their matched nonparticipating peers (39.0 NCEs vs. 38.1 NCEs, respectively). 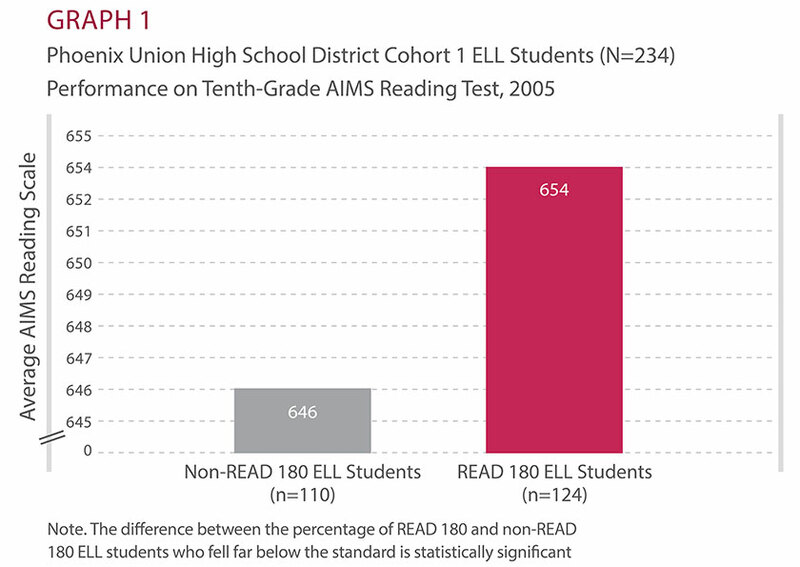 In addition to finding READ 180 participants outperforming matched nonparticipants after one year of READ 180, the study found that the benefits of participation in READ 180 persisted into tenth grade for English language learners (ELL) and low-performing students who had scored in the bottom third of their eighth-grade SAT-9 Reading Test. Among ELL students, READ 180 participants in Cohort 1 and Cohort 2 performed better than their matched nonparticipants on their tenth-grade AIMS Reading test in 2005. Cohort 1 ELL students achieved 654 scale score points, while matched ELL nonparticipants earned 646 scale score points (Graph 1). Similarly, Cohort 2 ELL READ 180 participants averaged scores that were significantly higher on the 2006 AIMS Reading test, one year after READ 180, than matched nonparticipants (650 and 642 scale score points, respectively). For students who had scored in the bottom third of their eighth- grade tests, prior to intervention, longitudinal results in both cohorts also indicate a lasting positive impact of READ 180. For example, Cohort 2 READ 180 students who had scored below 30 NCEs on their eighth-grade SAT-9 achieved higher scale scores on the tenth-grade AIMS Reading test, on average, than matched comparison students. Among these initially low-scoring students, READ 180 participants averaged 652 scale score points, while the comparison students averaged 648 scale score points. The difference is statistically significant (Graph 2). In a separate analysis, Scholastic Research (2006) analyzed READ 180 Cohort 3 SRI data disaggregated by student groups. The analysis revealed that African American participants averaged a gain of 11.9 NCEs, Hispanic participants averaged a gain of 9.4 NCEs, and all other participants averaged 9.6 NCEs (Graph 3). 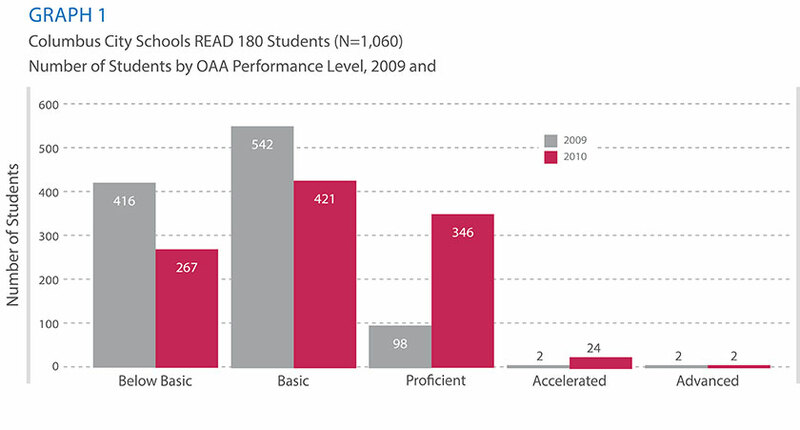 READ 180 students performing at Performance Level 2 on FCAT Reading significantly outperformed the control group. 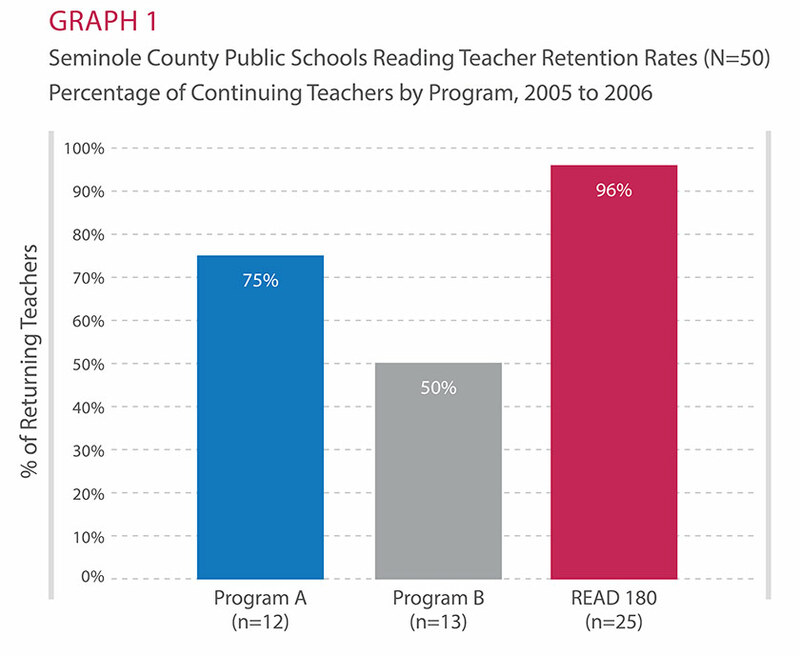 During the 2005–2006 and 2006–2007 school years, Seminole County Public Schools collaborated with researchers at the Florida Center for Reading Research (FCRR) and Florida State University (FSU) to compare the effects of different reading interventions in high schools on student achievement (Lang et al., 2009). Of the 1,197 ninth-grade students in the study, 51% were Caucasian, 20% were Hispanic, 20% were African American, and 9% represented other ethnicities. In addition, 43% of students were eligible for free and reduced-price lunch, and 12% were English language learners (ELL). Students were selected for the study based on their 2005–2006 Florida’s Comprehensive Assessment Test (FCAT) Reading test scores from the spring of their eighth-grade year. Three hundred eighty-five students reading below a fourth-grade level (Level 1 on the FCAT) were identified as “High Risk,” and 812 students reading between a fourth- and a sixth-grade level (Level 2 on the FCAT) were identified as “Moderate Risk.” Students in each level were randomly assigned to one of four intensive reading intervention programs: READ 180, a “business-as-usual” control group, a published reading intervention (Program A), or a thematic text-set approach (Program B). READ 180 was assigned to 307 students (or 25.6% of the total sample). Approximately 26% of READ 180 students were classified as High Risk students, and 26% of READ 180 students were classified as Moderate Risk students. In order to measure the effectiveness of READ 180, teacher- retention data and FCAT test scores were collected from READ 180 teachers and students. 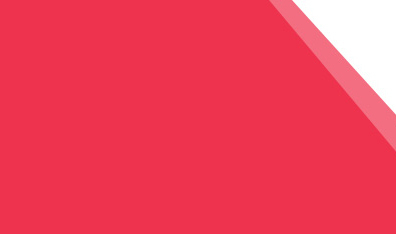 A preliminary analysis from Scholastic Research (2007) revealed that teachers of READ 180 had the highest retention rates during the 2005–2006 school year. The retention rate of READ 180 teachers was 96%. However, the teacher-retention rate of the other two interventions was much lower: 75% and 50%, respectively (Graph 1). 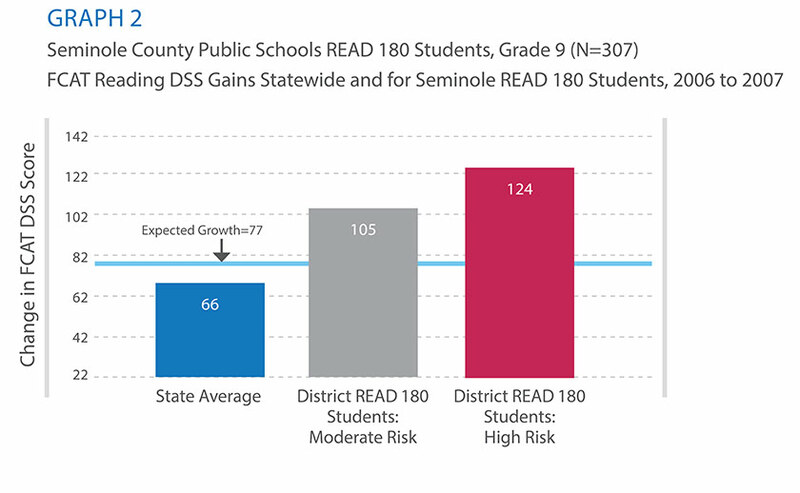 Results from the FCRR and FSU analysis revealed that from 2006 to 2007, the FCAT Developmental Scale Score (DSS) gains evidenced by READ 180 students exceeded both the state average and the state’s benchmark for expected growth. During the study year, the average statewide mean gain on the FCAT Reading between the end of eighth grade to the end of ninth grade was 66 DSS points, and the state benchmark for yearly growth was 77 DSS points. 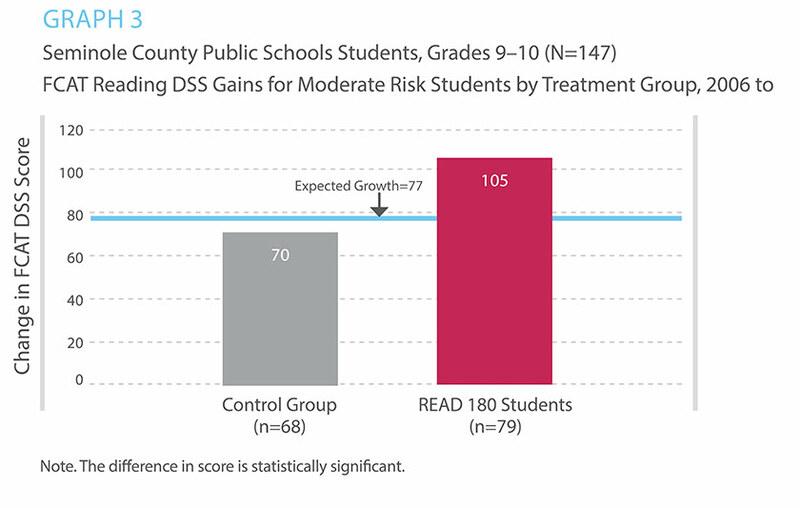 Among READ 180 students, those in the High Risk group gained an average of 124 DSS points and those in the Moderate Risk group gained an average of 105 DSS points (Graph 2). READ 180 raises reading levels for struggling high school students. Springfield Public Schools, the second largest school system in Massachusetts, is a Title I district enrolling over 25,000 students. Springfield has four high schools, three of which participated in the Striving Readers Program. The neighboring Chicopee Public Schools, also a Title 1 district, enrolls around 8,000 students. Chicopee has two high schools, both of which participated in the Striving Readers Program. From the 2006–2007 school year to the 2010–2011 school year, The Education Alliance at Brown University conducted a study involving five cohorts of targeted students from Springfield and Chicopee (Research and Evaluation Division, 2012). Students were randomly assigned to either the READ 180 treatment group, to a second intervention (Xtreme Reading) comparison group, or to a business-as-usual control group. In order to be eligible to participate in the study, students had to be reading at least two levels below grade level. Additionally, due to the requirements for Xtreme Reading, students identified for READ 180 were restricted to a range in performance from 680 Lexile (L) measures to 855L on the SRI. Seventy-one percent of the students who participated in the study were minority, 56% were female, 21% were students with disabilities, 4% were English language learners, and 69% received free or reduced-price lunch. To assess program impact, pretest and posttest data from the SDRT-4 were collected for 679 students (231 students in the READ 180 treatment group, 223 in the comparison group, and 225 in the control group) across the five years. To assess program implementation, input ratings and classroom model ratings were determined by teacher for each of the five years. 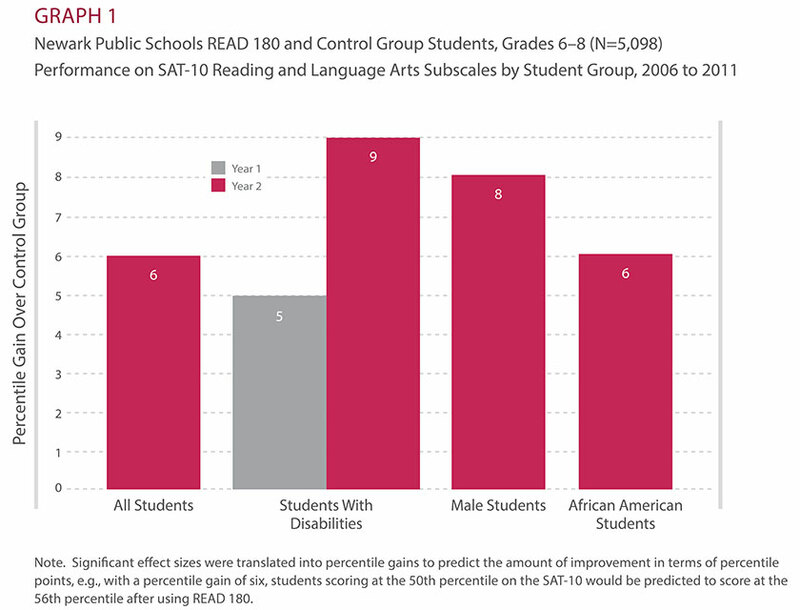 As Graph 1 displays, findings revealed that READ 180 students demonstrated greater gains than control group students on the SDRT-4 (effect size of .11). When the model was adjusted to account for pretest reading levels, this difference was significant (p=.03). READ 180 students outperformed the control group students, on average, by 1.5 points on unadjusted Normal Curve Equivalency (NCE) and 2.39 points on adjusted NCE. Conversely, students who were randomly assigned to the Xtreme Reading program did not show statistically significant gains over the control group students. 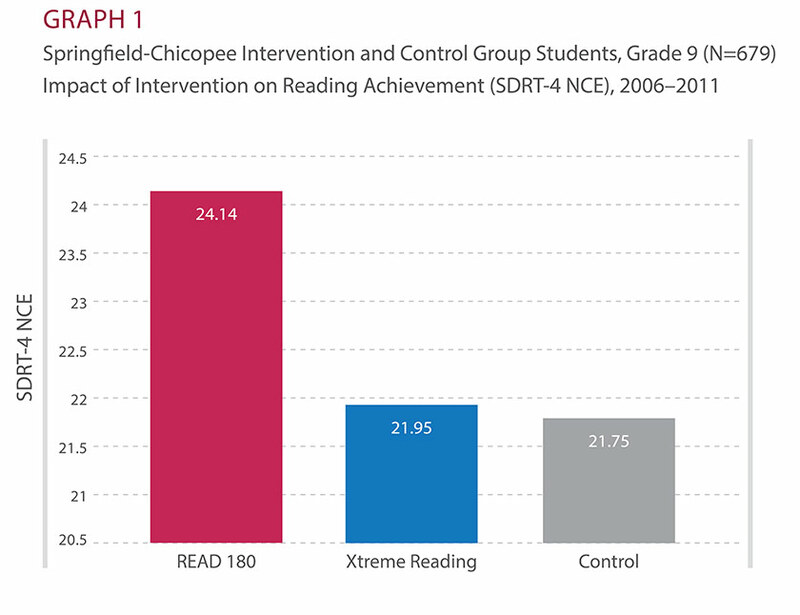 As Graph 2 shows, in schools where READ 180 classroom implementation levels were observed to be moderate or high, the average reading scores of READ 180 students, as measured by SDRT-4 NCE scores, were higher at posttest than control group scores. Controlling for pretest scores and other student characteristics, this difference was statistically significant. Results were more consistent over time for the majority of teachers, especially those implementing at high levels over the entire study period. This same pattern of findings was not found for Xtreme Reading schools. When Xtreme Reading classroom implementation levels were assessed in relationship to outcome scores, the relationship was not significant. Serving 19,742 students in Grades K–12, Alvord Unified School District (AUSD) consists of 22 schools. The district serves almost 20,000 students, with approximately 2,000 students with disabilities and 9,000 English language learners (ELL). Twenty-three percent are economically disadvantaged. The majority of students are Hispanic (78%), followed by Caucasian (13%), Asian (5%), and African American (4%). The Alvord Unified School District used READ 180 over the 2010–2011 and 2011–2012 school years during the school day and as part of the after-school program. This study focused on fourth and fifth graders who used READ 180 as part of the after-school program three to four times a week. Data from the California Standards Test of English Language Arts (CST ELA) and SRI were collected from 83 READ 180 after-school students (46 fourth graders and 37 fifth graders) in the 2010–2011 school year (Cohort 1) and 126 after-school students (47 fourth graders and 79 fifth graders) in the 2011–2012 school year (Cohort 2). As Graph 1 displays, in Cohort 1, both fourth and fifth graders demonstrated gains in reading achievement after one year of READ 180, as measured by the CST ELA. The percentage of students scoring at the Basic, Proficient, and Advanced levels increased from 46% in 2010 to 70% in 2011. In tandem, the percentage of students scoring at the Below Basic and Far Below Basic levels decreased from 55% in 2010 to 30% in 2011. As Graph 2 displays, in Cohort 2, both fourth and fifth graders again demonstrated gains in reading achievement after one year of READ 180, as measured by the CST ELA. The percentage of students scoring at the Basic, Proficient, and Advanced levels increased from 48% in 2011 to 80% in 2012. In tandem, the percentage of students scoring at the Below Basic and Far Below Basic levels decreased from 52% in 2011 to 19% in 2012. These findings held for students with disabilities and ELLs, who also showed improvements on the CST ELA. In Cohort 1, 75% of students with disabilities and 45% of ELLs improved one or more performance levels. Forty-eight percent of students overall made such improvements. In Cohort 2, 33% of students with disabilities and 56% of ELLs improved one or more performance levels. Fifty-six percent of students overall made such improvements. Consistent with the CST ELA findings, both fourth- and fifth-grade READ 180 students evidenced significant gains in reading comprehension (Table 1). In Cohort 1, READ 180 students made statistically significant gains on the SRI from pretest to posttest. Forty-six percent of fourth graders exceeded their individual fall-to-spring Lexile growth expectations, as did 54% of fifth graders. Similarly, in Cohort 2, READ 180 students made statistically significant gains on the SRI from pretest to posttest. Fifty-one percent of fourth graders exceeded their individual fall-to-spring Lexile growth expectations, as did 51% of fifth graders. Again, these findings held for students with disabilities and ELLs. In Cohort 1, READ 180 students with disabilities made statistically significant gains on the SRI from pretest to posttest, as did ELLs. Twenty-five percent of students with disabilities exceeded their individual fall-to-spring Lexile growth expectations, and 45% of ELLs exceeded their individual fall-to-spring Lexile growth expectations. In Cohort 2, READ 180 students with disabilities again made statistically significant gains on the SRI from pretest to posttest, as did ELLs. Seventy-five percent of students with disabilities exceeded their fall-to-spring Lexile growth expectations, and 43% of ELLs exceeded their fall-to-spring Lexile growth expectations. Urban students improve attendance and scores on vocabulary, comprehension, and total reading measures after using READ 180 in an after-school program. Brockton Public Schools (BPS) is one of the largest districts in Massachusetts, with an ethnically diverse and predominantly low-income population. BPS used READ 180 with its after-school students who scored below the Proficient level on the Massachusetts Comprehensive Assessment System (MCAS) reading and language arts assessments from the 2005–2006 school year to the 2007–2008 school year. Three independent studies were conducted to evaluate the impact of READ 180 on these BPS students. From 2005–2007, MPR Associates, Inc. conducted a two-year study involving three elementary schools in the first year (2005–2006) and four in the second year (2006–2007) (Hartry, Fitzgerald, & Porter, 2008). Funded by the William T. Grant Foundation, the goal of the study was to determine whether READ 180 could be used in an after-school setting with students in Grades 4–6. Results were originally published in the Harvard Educational Review. Under the larger scope of the National Partnership for Quality Afterschool Learning, SEDL funded an RCT to evaluate the impact of three after-school interventions on student achievement. SEDL hired MPR to conduct the study at BPS, as an extension of MPR’s previous work. The SEDL-funded study spanned two school years, 2006–2007 and 2007–2008 (Vaden, Kiernan, Hughes, Jones, & Rudo, 2008). As part of the larger Hartry et al. (2008) implementation study, an evaluation was also conducted to determine the program’s impact on several literacy outcomes. Results were published in Educational Evaluation and Policy Analysis (Kim, Capotosto, Hartry, & Fitzgerald, 2011). During the first study, MPR collected and analyzed after-school attendance and attrition data from all participating after-school students from 2005–2007. Findings revealed that READ 180 after-school attendance rates were significantly higher than students in the control after-school program (Table 1). Of the 95 students who withdrew from the after-school program but remained in the district, 36 were from the READ 180 program and 59 were from the control group, a statistically significant difference. During the second study, SEDL MPR also collected pretest and posttest SAT-10 data from READ 180 and control group participants. 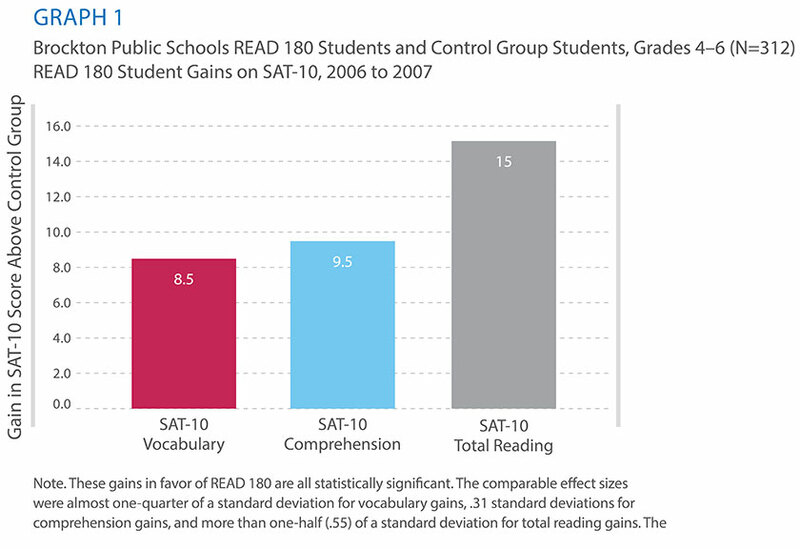 Findings indicated that READ 180 students scored 8.5 points higher on vocabulary, 9.5 points higher on reading comprehension, and 15 points higher on total reading than control group students (Graph 1). When the results were disaggregated, gains were especially notable for African American and low-income students on vocabulary, comprehension, spelling, and total reading. The significant results were not maintained in the second year of the SEDL-funded study, likely due to the change in schedule from four days to two days each week and to the overall higher baseline performance (fewer struggling readers) in the second year. As Graph 2 displays, Kim et al. (2011) also found that READ 180 had a significant positive effect on vocabulary and comprehension beyond that of the district’s regular after-school program (effect sizes of .23 and .32, respectively). The majority of the students in the study (95%) scored below Proficient on a state assessment of English Language Arts. Job Corps students who participated in READ 180 gained four or more grade levels on the Test of Adult Basic Education. Since 1964, Job Corps, a national program designed to provide at-risk young adults with educational and job training, has helped over two million youths gain the skills needed to obtain long-term employment opportunities. Job Corps provides vocational training and academic services in areas such as reading and math. Enrollment in Job Corps is voluntary, with students entering the program at different times and progressing at their own pace. Students entering the program range in age from 16 to 24. The typical Job Corps student is an 18-year-old high school dropout who reads at the seventh-grade level, belongs to a minority group, and has never held a full-time job. Approximately 70% of Job Corps enrollees are members of minority groups, 80% are high school dropouts, and more than 30% are from families on public assistance. The School for Integrated Academics & Technologies (SIATech) is a public charter high school with campuses located at Job Corps centers nationwide. Prior to 2004, SIATech was known as Guajome Park Academy. During the 2002–2003 school year, SIATech implemented READ 180 at four of its Job Corps sites in California. From 2002 to 2003, 68 students participated in READ 180 for four to eight weeks, and 39 students participated in READ 180 for nine weeks or longer. Student achievement data were collected by SIATech and analyzed by an independent researcher in collaboration with Scholastic Research (Admon, 2004). In order to measure the effectiveness of READ 180, results from the Test of Adult Basic Education (TABE) were analyzed. 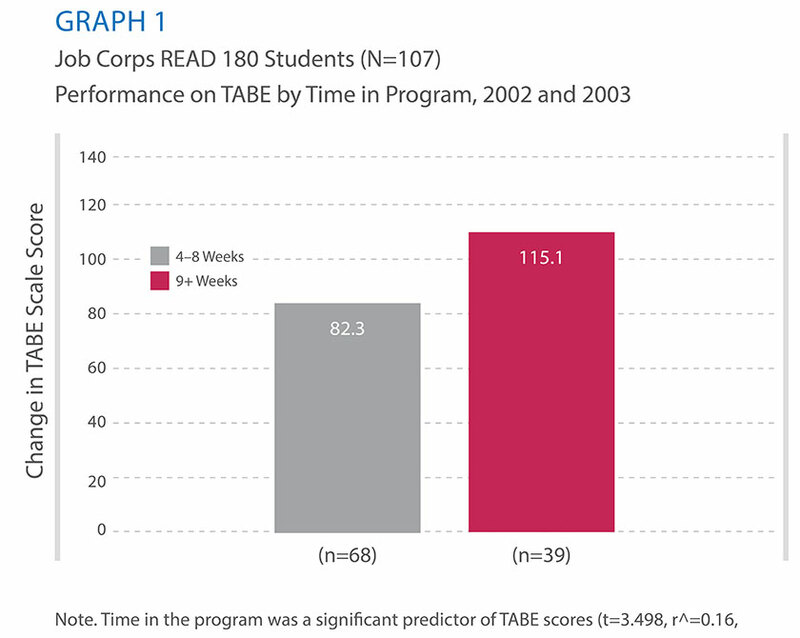 On average, students who were in READ 180 for four to eight weeks gained 82.3 TABE points while students in READ 180 for nine weeks or longer gained 115.1 TABE points (Graph 1). For this analysis, students’ pretest and posttest mean scores were converted to grade equivalents. On average, students using READ 180 for four to eight weeks gained four grade levels, while students in READ 180 for nine weeks or longer gained five grade levels (Table 1). Correlation and multiple regression tests revealed that time spent in the program had a significant and positive impact on TABE scores. The average growth from pretest to posttest was larger for students who stayed in READ 180 longer. The greatest gains were made by students who were in the READ 180 program for an average of 16 weeks. These students were also the lowest-performing students at pretest. READ 180 improves reading outcomes for incarcerated students. The Ohio Department of Youth Services (ODYS) is the juvenile corrections system for approximately 110,000 youth, ages 10 to 21, in the state of Ohio. There are currently four ODYS facilities, each of which operates a year-round school that offers general curriculum as well as vocation opportunities. At the start of the Striving Readers Program1, there were eight facilities in ODYS; however, by year five there were only five facilities that remained open. From the 2006–2007 school year to the 2010–2011 school year, The Ohio State University conducted a study involving five cohorts of eligible students from the ODYS facilities (Loadman, Moore, Zhu, Zhao, & Lomax, 2011). Students were randomly assigned to receive either READ 180 instruction or traditional English classes. In order to be eligible to participate in the study, students had to meet three criteria: 1) assigned to the care of ODYS for more than six months; 2) have a Lexile (L) measure below grade level (approximately 1000L), but above Below Basic level (200L or less), at baseline on the SRI; and 3) cannot be a high school graduate. The majority of students who participated in the study were African American (70.3% in the READ 180 group and 68.2% in the control group), followed by Caucasian (22.9% and 25.7%, respectively). Of these students, 96.2% in each group were male. 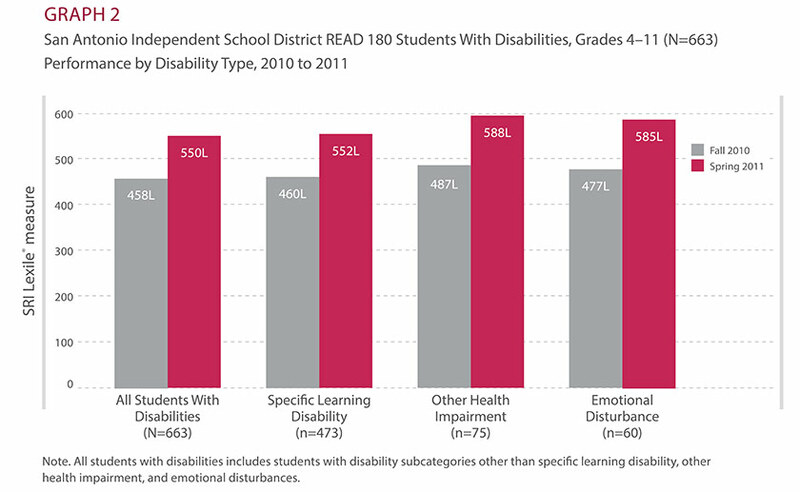 In the READ 180 group, 44.8% were classified as students with disabilities. As Table 1 shows, these students were further classified by type of disability. The Striving Readers Program was funded by the United States Department of Education with two aims: 1) to raise middle and high school students’ literacy levels in Title I-eligible schools with significant numbers of students reading below grade levels; and 2) to build a strong, scientific research base for identifying and replicating strategies that improve adolescent literacy skills. The full reports for each district are available at www2.ed.gov/programs/strivingreaders/. To assess program implementation, input ratings and instructional model ratings were determined for each of the five years. To assess program impact, data from SRI was collected across the five years for 1,245 students (677 students in the READ 180 treatment group and 568 in the control group), and data from the ReadCAT was collected for 243 students (133 students in the READ 180 treatment group and 110 in the control group). Table 2 summarizes the five years of program implementation ratings. 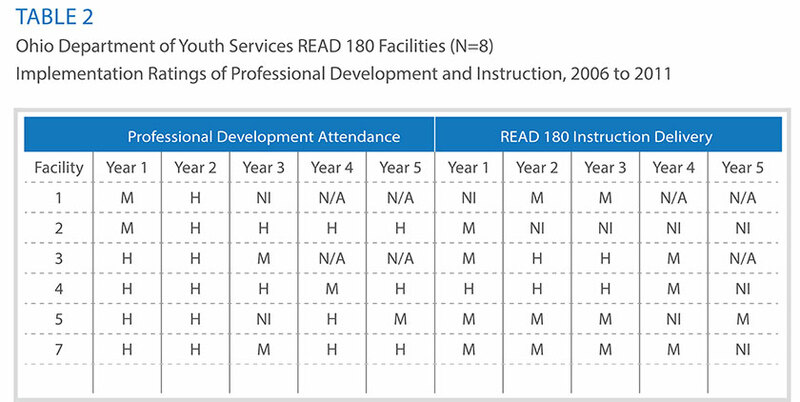 Overall, implementation of READ 180 occurred at a high level 49% of the time and at a moderate level 32% of the time across the five years. Nineteen percent of the time, the implementation was deemed in need of improvement. The professional development implementation was rated more highly than the instruction implementation. The majority of the time, professional development attendance was high (71%), followed by moderate attendance (19%) and attendance deemed in need of improvement (10%). For the instruction implementation, the majority of the time the amount of READ 180 instruction delivery was moderate (44%), followed by an equal amount of high delivery and delivery that was deemed in need of improvement (28% in both cases). 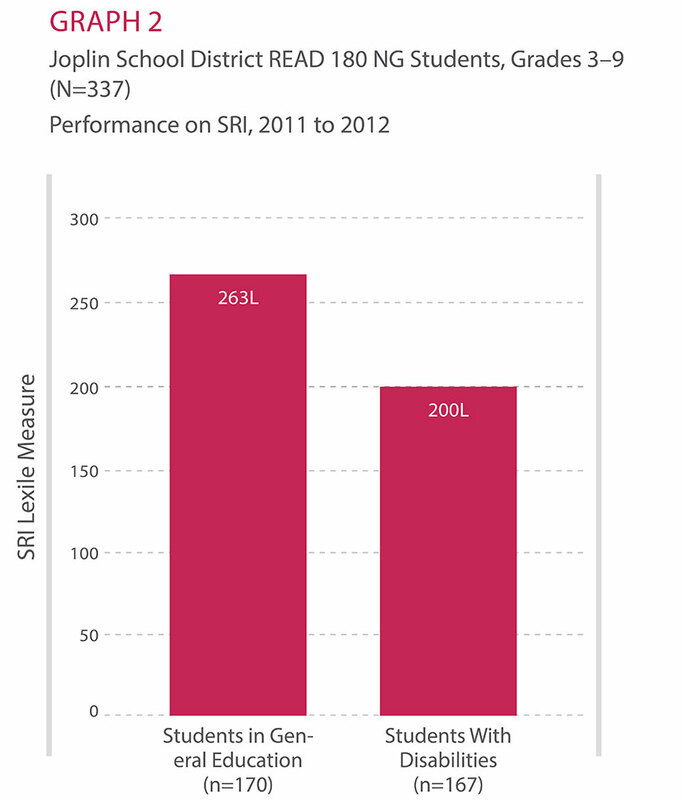 SRI results revealed a significant overall impact on Lexile measures (effect size of .21) for READ 180 students (Graph 1). Students in the READ 180 group outperformed the control group students by an average of 59 Lexile points. Additionally, according to ReadCAT Grade Equivalent scores, READ 180 had a significant overall impact on student reading outcomes (effect size of .26). Students in the READ 180 group outperformed the control group students by an average of 0.61 scale points, the equivalent of over half a year’s gain. Community college READ 180 students demonstrated greater reading growth on CPRT and higher college retention rates than control group students. 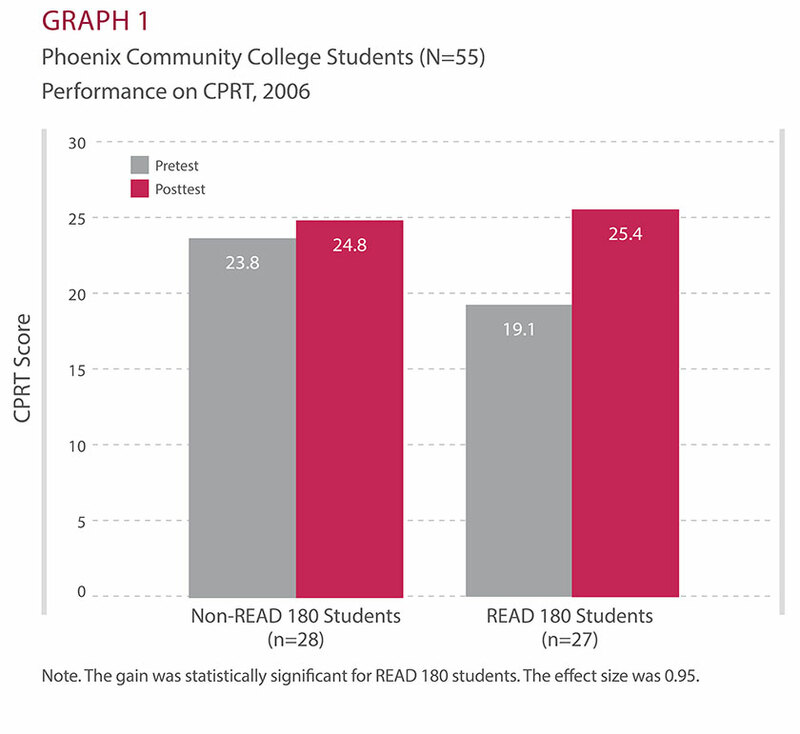 During the spring and summer of 2006, Phoenix Community College in Arizona began implementation of READ 180 with students in developmental reading and English as a Second Language (ESL) classes to determine if READ 180 could be a viable alternative to traditional developmental reading courses in community colleges. READ 180 was implemented in two five-week summer sessions, for 120 minutes a day, four days per week. The district implemented READ 180 as part of a controlled research study (Scholastic Research, 2007), with a total of 27 students participating in READ 180 and 28 control group students receiving the traditional developmental reading curriculum. In order to measure the impact of READ 180 on college reading readiness, pretest and posttest data from the College Preparatory Reading Test (CPRT) were collected. Results indicate that READ 180 students evidenced statistically greater growth on the CPRT than students in the control group. While READ 180 students showed a statistically significant gain of 6.3 points on the CPRT, the control group demonstrated a gain of only one point (Graph 1). 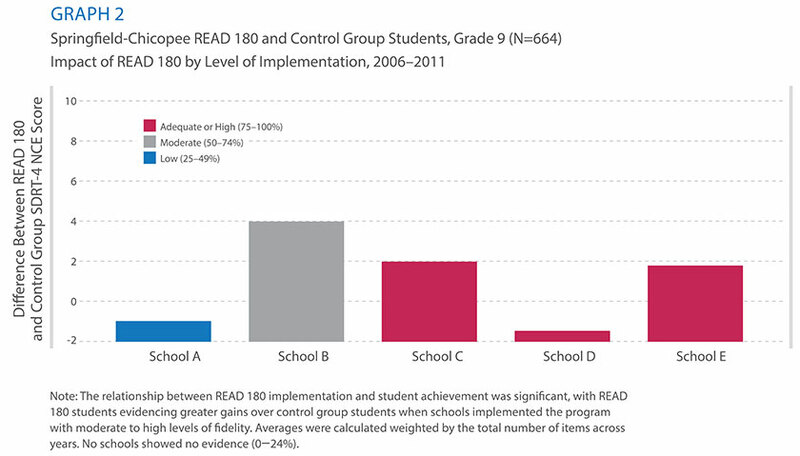 Further, the effect size for READ 180 was 0.95 (compared with 0.19 for the control group). During the 2006–2007 school year, college enrollment data was also collected. Findings showed that the percentage of READ 180 participants still enrolled in college at the end of the academic year was substantially higher than that of the control group students. Overall, 70% of the READ 180 participants were still enrolled in the college at the end of the academic year. By contrast, only 50% of the control group was still enrolled. In addition, READ 180 students were asked to assess their own reading skills and the READ 180 program at three points during each summer session. Survey data revealed that students felt READ 180 had positively impacted their reading skills. Well over 80% of the students agreed or strongly agreed that READ 180 had helped them to read faster and to understand better what they read. In addition, 93% of the students agreed or strongly agreed that what they learned in READ 180 will help them in their other college courses (Graph 2).